Pacific County (pop. 20,920) is in the southwestern corner of Washington. 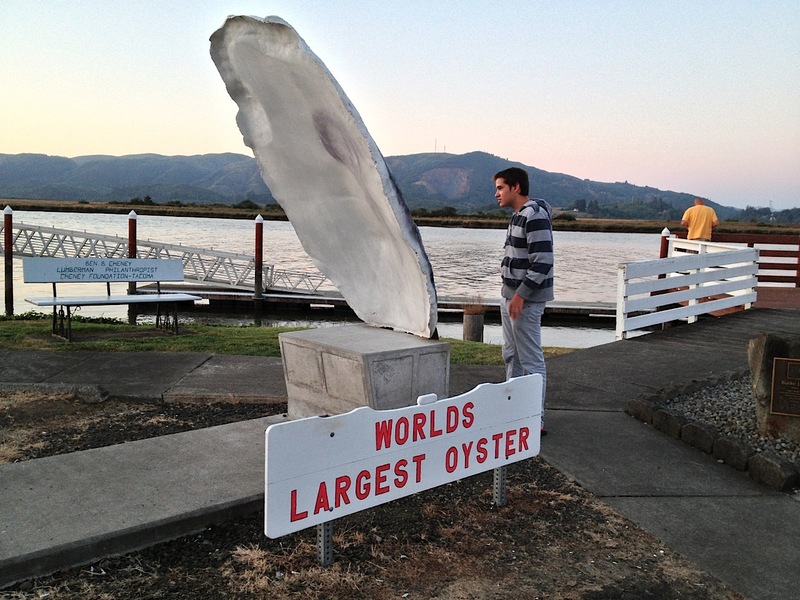 It’s the only Pacific County in the U.S.
Willapa Bay, the second-largest estuary on the U.S. Pacific coast, is a major producer of oysters. San Francisco Bay is larger. The county seat of Pacific County is the city of South Bend (pop. 1,637). Comedian and six-time presidential candidate Pat Paulsen (1927-1997) was born in South Bend. 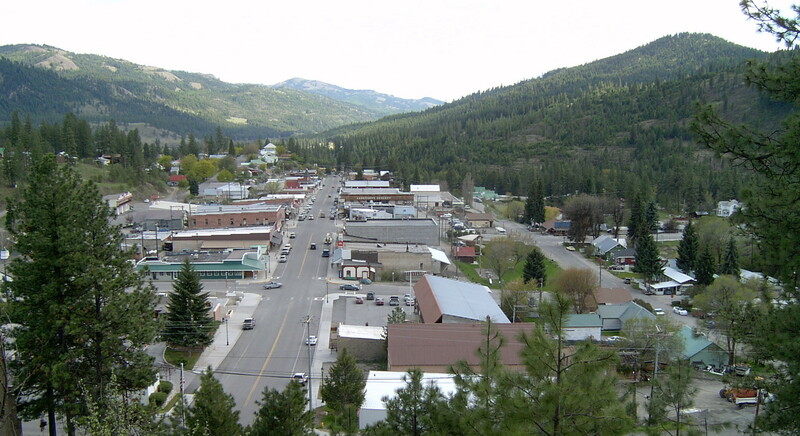 The largest city in Pacific County is Raymond (pop. 2,886). It reached its peak of population (4,260) in 1920. 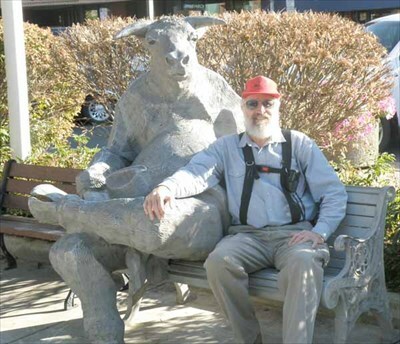 Raymond has a collection of more than 200 metal sculptures scattered along its roads and highways. The project started in 1993. 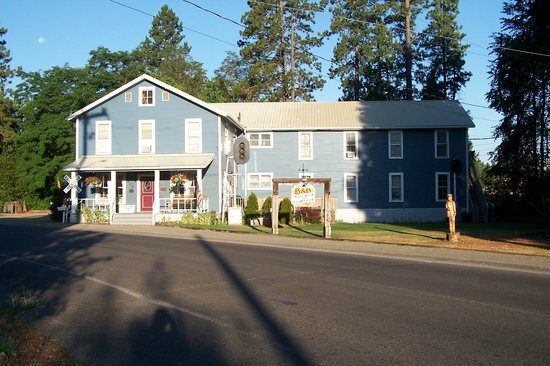 West of Raymond, the community of Tokeland is the home of the Tokeland Hotel, the oldest resort hotel in Washington. It opened in 1889. Bathrooms are down the hall. The Long Beach Peninsula, which encloses Willapa Bay, has 28 miles of continuous sand beaches. The peninsula, popular with visitors from Seattle and Portland, has several state parks. The resort city of Long Beach is the home of the World Kite Museum and Marsh’s Free Museum, featuring Jake the Alligator Man. Grays Harbor County (pop. 72,797) is south of Jefferson County. 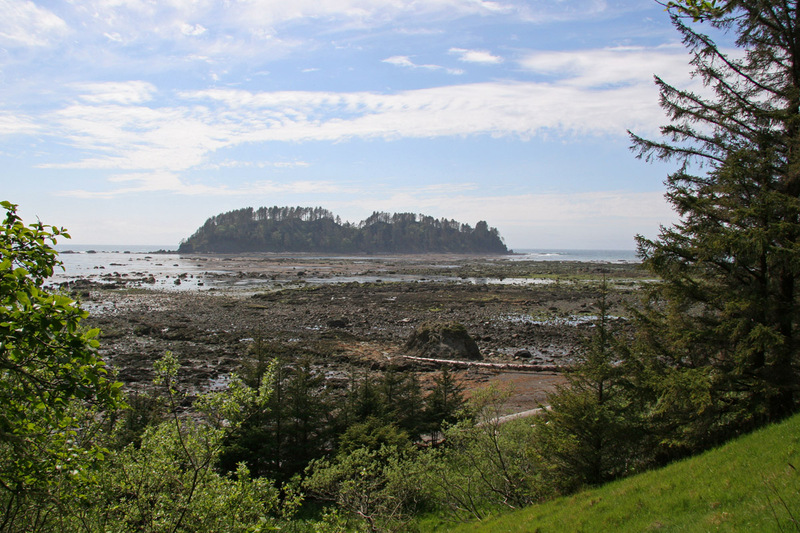 It was named for Grays Harbor, the large estuarine bay in the southwestern corner of the county. Grays Harbor was named for Robert Gray (1755-1806), an American merchant sea captain who pioneered the maritime fur trade in the Northwest and discovered the bay. He also named the Columbia River. 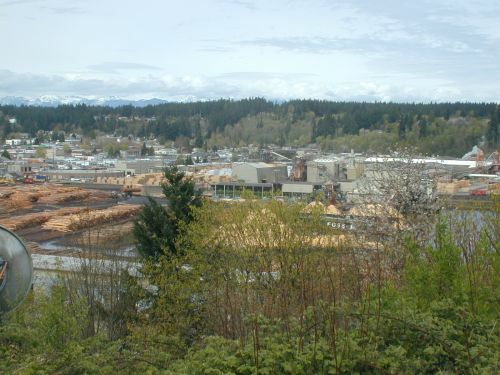 The county has historically depended on the timber and fishing industries; several of its cities, including Aberdeen and Hoquiam, reached their peak populations in 1930. 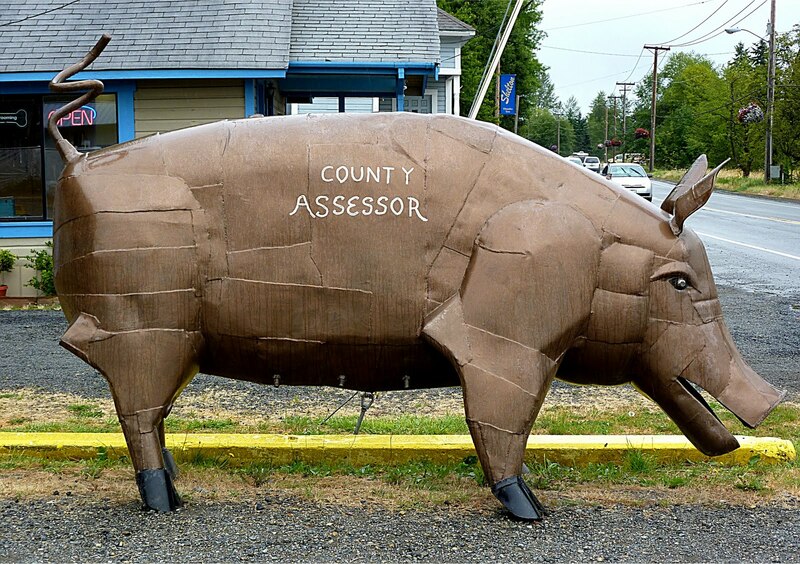 The county seat of Grays Harbor County is the city of Montesano (pop. 3,976). 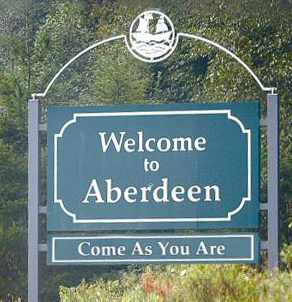 The largest city in the county is Aberdeen (pop. 16,896), located where the Chehalis River empties into Grays Harbor. Kurt Cobain (1967-1994), leader of the rock band Nirvana, was born in Aberdeen and dropped out of Aberdeen High School late in his senior year. 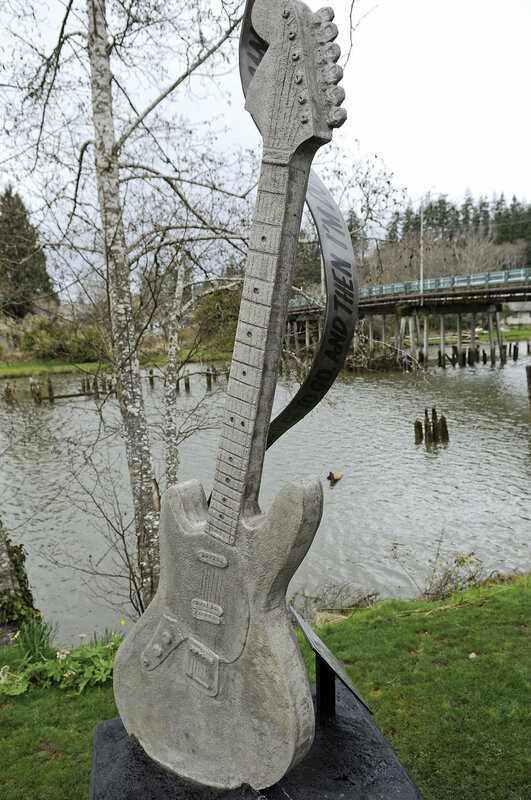 A concrete guitar in Aberdeen honors Cobain. 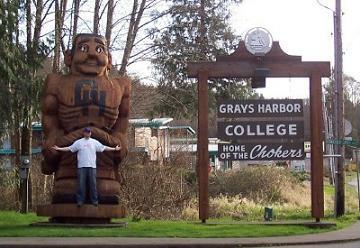 Grays Harbor College is a community college in Aberdeen, founded in 1930. The athletic teams are called the Chokers – an old term for the men who wrestled giant logs out of the nearby forests. The Lady Washington, home-ported in Aberdeen, is a replica of an 18th-century merchant sailing ship. Built in 1989, it has been featured in several movies. Just west of Aberdeen is the city of Hoquiam (pop. 8,726). Its 7th Street Theatre is an atmospheric theater built in 1928. East of Montesano, the Satsop Nuclear Power Plant was built from 1976 to 1983 but never completed, because of a budget shortfall. The twin cooling towers are a local landmark. The city of Westport (pop. 2,099), at the entrance to Grays Harbor, has one of the largest marinas in the Northwest. The Grays Harbor Light (1898), at 107 feet, is the tallest lighthouse in Washington. 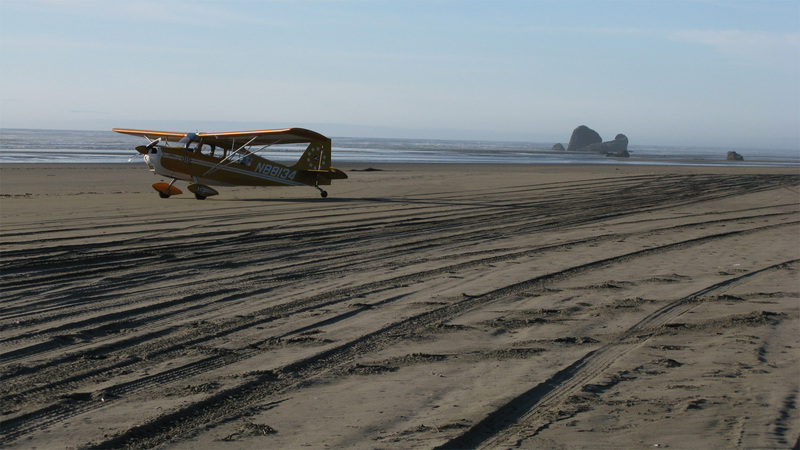 Farther north, the Copalis State Airport is the only airport in Washington where landing on the beach is legal. The runway is 4,500 feet long. A small part of Olympic National Park is in northern Grays Harbor County. The Lake Quinault Lodge is near the park, in Olympic National Forest. Jefferson County (pop. 29,872), south of Clallam County, stretches from the Pacific Ocean to Puget Sound, with the Olympic Mountains in the middle. No roads cross directly from the county’s west side to its east side. It is one of 25 Jefferson Counties (and one Jefferson parish) in the U.S. – all named, directly or indirectly, for President Thomas Jefferson (1743-1826). Mount Olympus (elev. 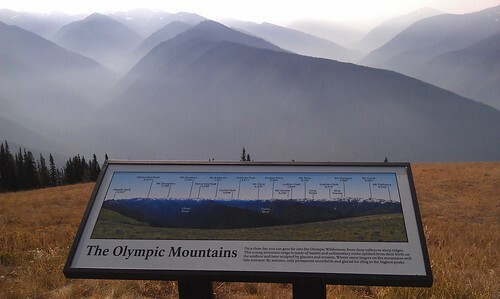 7,980) is the highest point in Olympic National Park. Because of its heavy winter snowfall, it supports several large glaciers – the longest of which is three miles long. Temperate rainforests in the western part of Olympic National Park have about 150 inches of annual precipitation. 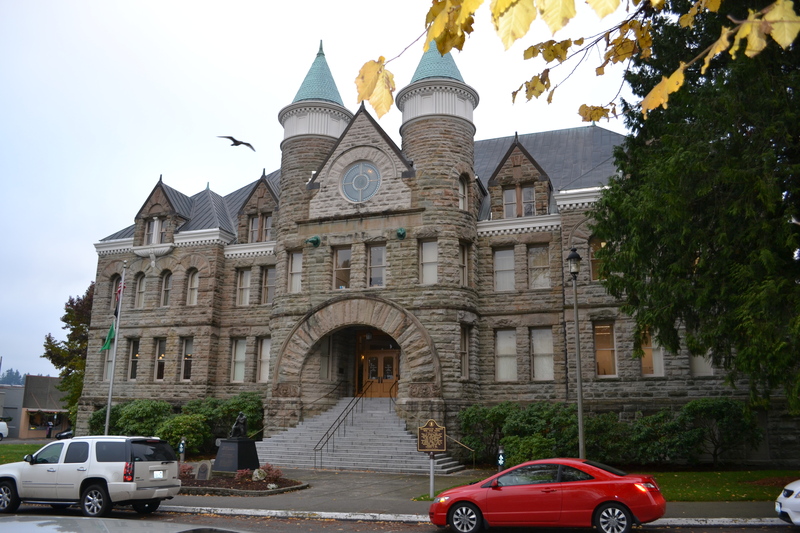 The county seat of Jefferson County (and its only incorporated city) is Port Townsend (pop. 9,126), on the northeastern tip of the Olympic Peninsula. 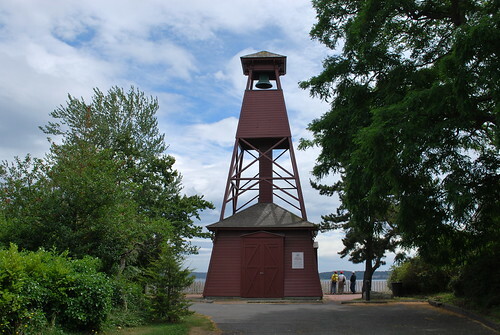 The 75-foot Fire Bell Tower in Port Townsend dates from 1890. It’s been restored several times. Fort Worden, in Port Townsend, was built in 1897-1900 as an Army base to protect Puget Sound from enemy invasion. No hostile shots were ever fired. Manresa Castle, originally a 30-room private home built in 1892, is now a hotel and restaurant. 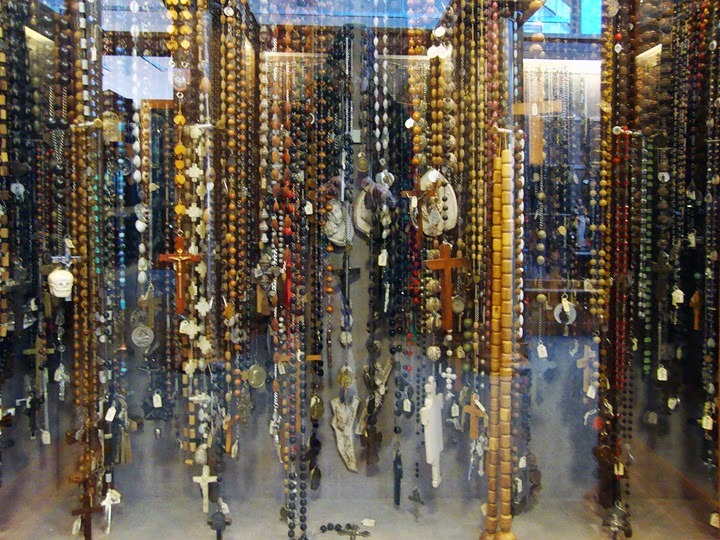 It was also a Jesuit training center for many years. 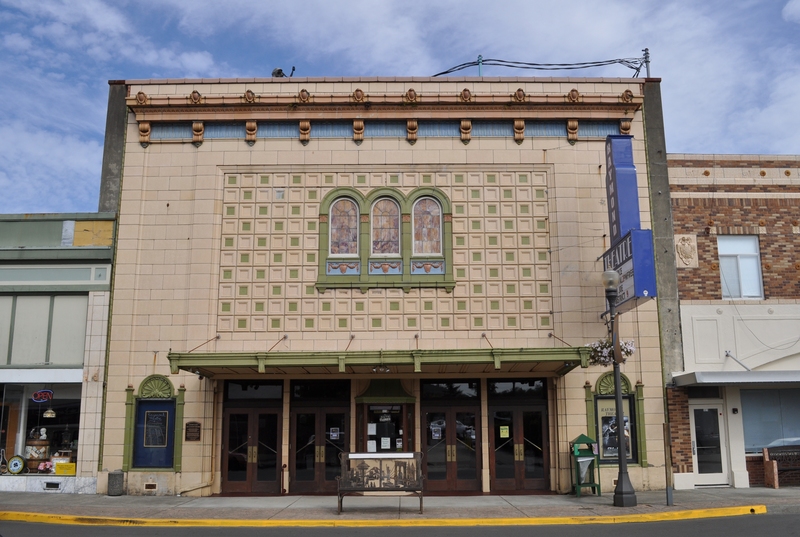 The Rose Theatre in Port Townsend opened as a vaudeville theater in 1907. It now shows a variety of independent films. Port Townsend has an annual film festival. South of Port Townsend is Fat Smitty’s Restaurant, known for its burgers, outdoor decorations, and dollar bills attached to the ceiling and walls. Cape Alava, near Ozette Lake, is the westernmost point in the contiguous 48 states; the community of Ozette is the westernmost town. The county seat of Clallam County is the city of Port Angeles (pop. 19,038). Football great John Elway was born in 1960 in Port Angeles, where his father was coaching football at Port Angeles High School. The family moved away a year later. The M/V Coho ferry has been going back and forth between Port Angeles and Victoria, B.C., since 1959. The 20-mile trip takes about 90 minutes. Port Angeles is the headquarters of Olympic National Park, which is in four counties (including Clallam). 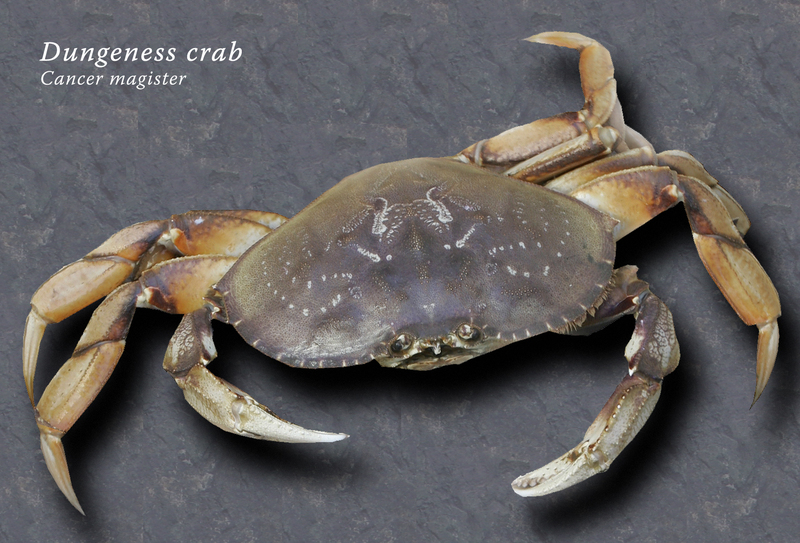 Near Sequim, on the Strait of Juan de Fuca, is the unincorporated community of Dungeness, which gave its name to the Dungeness crab. The city of Forks (pop.3,532), west of Port Angeles, receives about 119 inches of rain a year. Forks is the setting for Stephenie Meyer’s “Twilight” books. The movies were not filmed in Forks. Island County (pop. 78,506), southeast of San Juan County, is made up entirely of islands. It is Washington’s second-smallest county in land area, and the only Island County in the U.S.
Whidbey Island, 55 miles long and 1-12 miles wide, is Washington’s largest island and the fourth-largest island in the lower 48 states. Whidbey Island is accessible by ferry (from Port Townsend and Mukilteo) and via the Deception Pass Bridge, at the north end of the island. 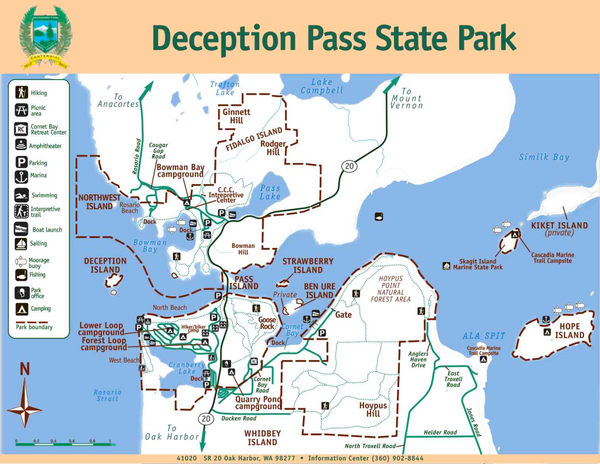 Deception Pass State Park is the most-visited state park in Washington. 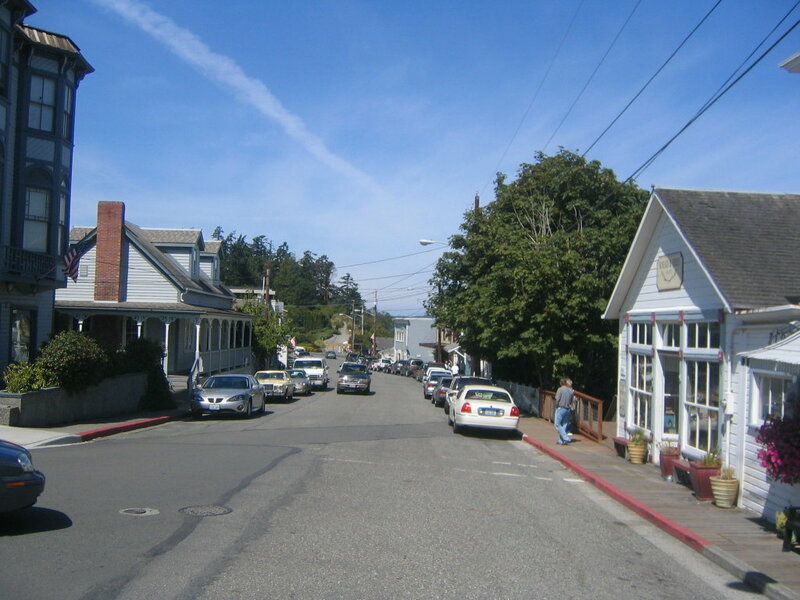 The county seat of Island County is the town of Coupeville (pop. 1,831), the second-oldest town in Washington – founded in 1852 by Captain Thomas Coupe. 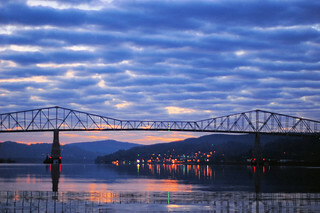 The largest city in Island County is Oak Harbor (pop. 22,075). 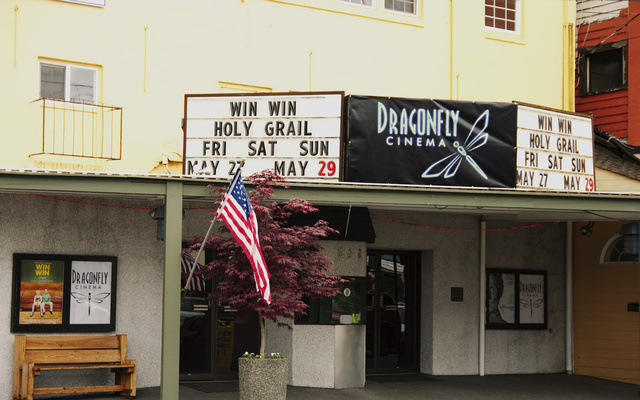 Oak Harbor has one of Washington’s five remaining drive-in movie theaters. Flintstone Park in Oak Harbor has a replica of Fred Flintstone’s rock car. 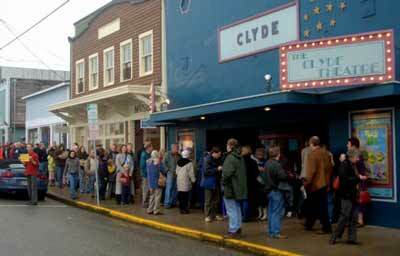 In the southern part of Whidbey Island, the city of Langley is the home of the Clyde Theatre, built in 1937 by Norman and Hazel Clyde and still operated by the same family. Naval Air Station Whidbey Island is in the northern part of the island. It opened in 1942. San Juan County (pop. 15,769) is Washington’s smallest county in land area. 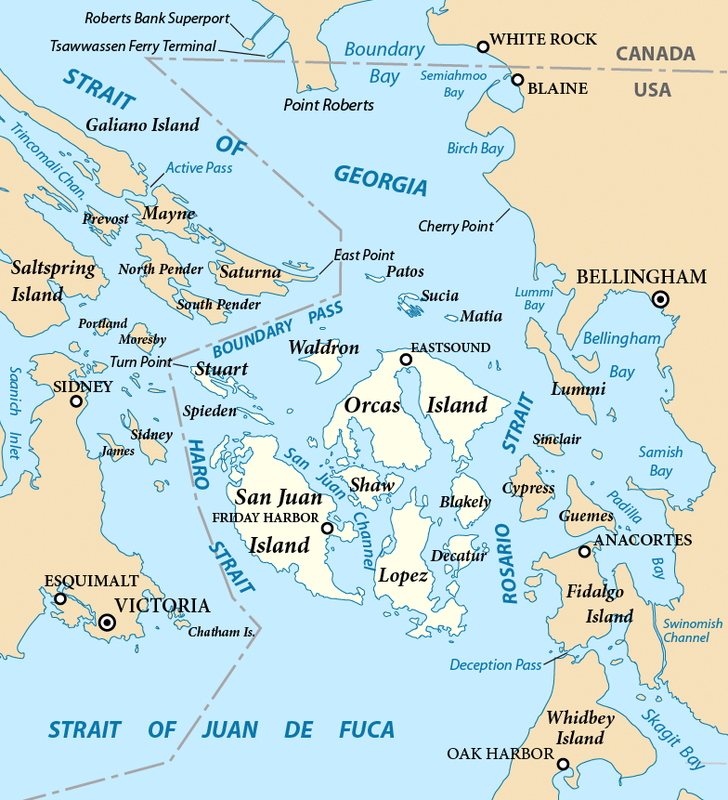 It is composed of the 172 named San Juan Islands, plus many more unnamed ones. The county was named for the islands, which were named for Juan Vicente de Guemes Padilla Horcasitas y Aguayo, 2nd Count of Revillagigedo, who sent an expedition to the area in 1791. 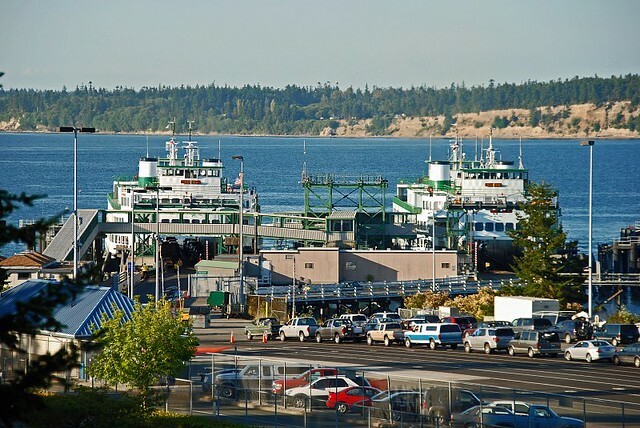 The four largest islands – Orcas, San Juan, Lopez, and Shaw – are served by the Washington State Ferries from Anacortes. Friday Harbor (pop. 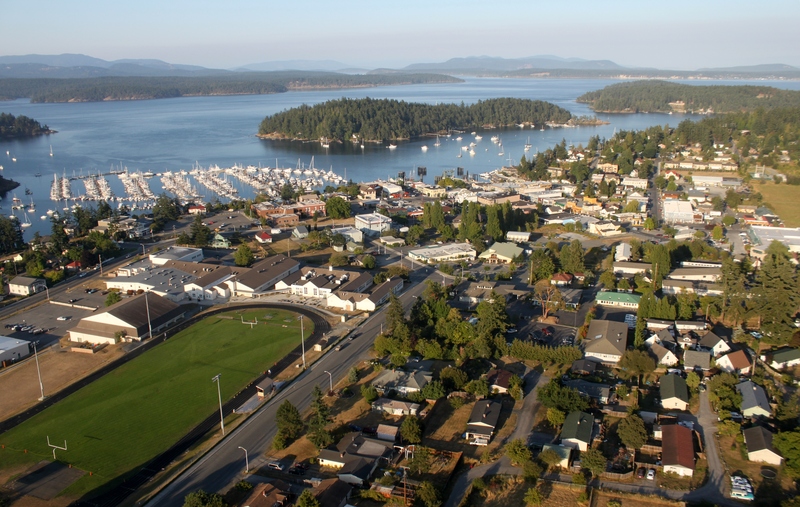 2,162), on San Juan Island, is the county seat, the commercial center, and the only incorporated city in the county,. Only about 15 miles by air from Victoria, B.C. Lopez Island, just east of San Juan Island, is flatter and more rural than the other large islands. On Lopez Island, drivers (and cyclists and pedestrians) traditionally wave at each other at every opportunity. Spencer Spit State Park is on the east side of Lopez Island. Orcas Island is the largest of the San Juans. 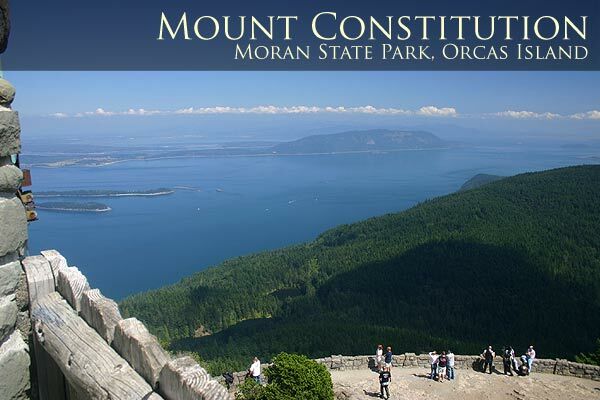 Mount Constitution (elev. 2,407) is the highest point in the county. 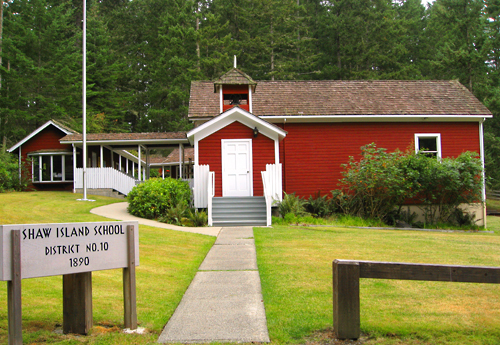 The “Little Red Schoolhouse” on Shaw Island, which serves grades K-8, has been in continuous operation since 1890. A second classroom was added in recent years. 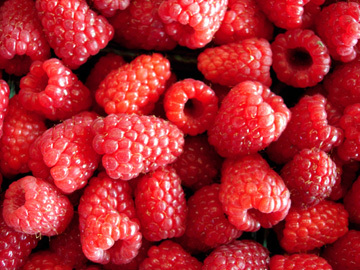 Whatcom County produces about 75 percent of the nation’s commercial raspberries. The Northwest Raspberry Festival is in Whatcom County. Mount Baker (elev. 10,781 feet) is in the eastern part of the county. The Mt. Baker Ski Area had 95 feet of snow in the 1998-99 season. The most heavily glaciated of Cascade volcanoes. The county seat of Whatcom County is the city of Bellingham (pop. 80,885), the only city in the lower 48 states that experiences twilight all night during part of the summer. 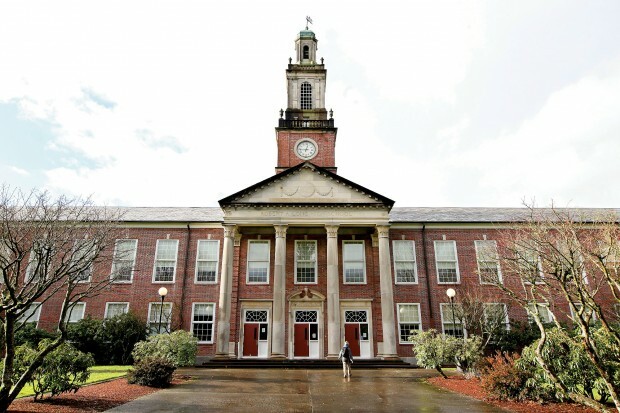 Western Washington University in Bellingham was founded in 1893 as the New Whatcom Normal School. It has about 15,000 students. 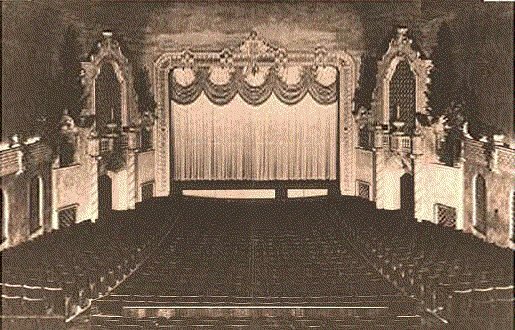 The Mount Baker Theatre (1927) now has a variety of concerts and theatrical performances. 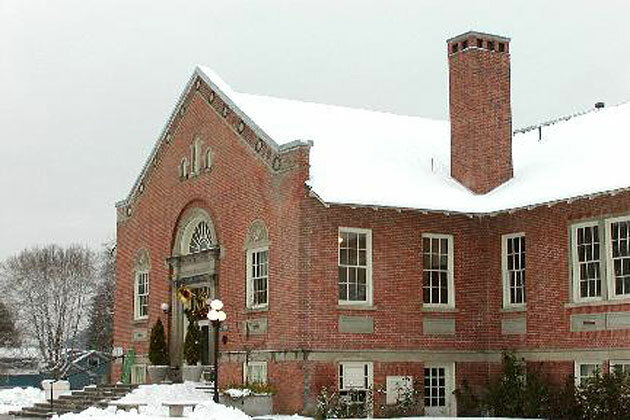 The Whatcom Museum of History and Art is in the former city hall, dating from when Bellingham was called New Whatcom. Rocket Donuts in downtown Bellingham has a science-fiction theme and a rocket in the parking lot. The city of Blaine (pop. 4,831) is on the border with British Columbia. 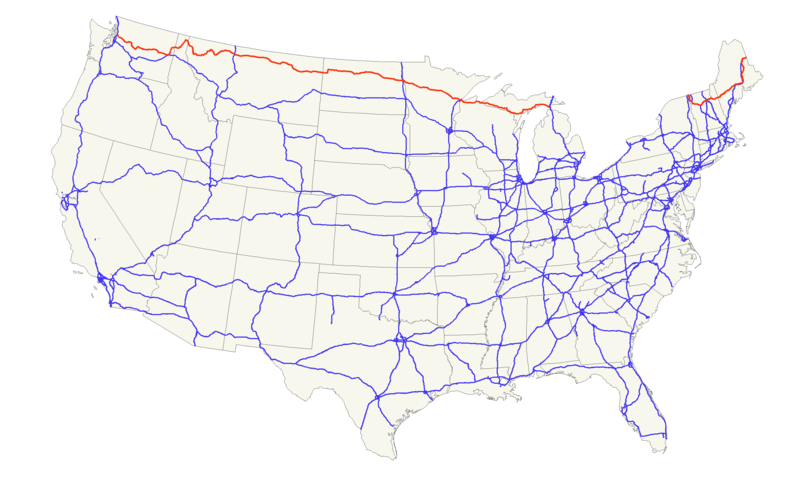 Interstate 5 runs 1,381 miles from Blaine to the Mexican border near San Diego. 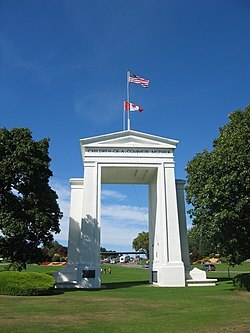 The Peace Arch, on the U.S.-Canada border between Blaine and Surrey, B.C., was dedicated in 1921. A few miles west of Blaine (by water) is Point Roberts (pop. 1,314), located at the southern tip of the Tsawwassen Peninsula. To reach Point Roberts by land, one must go 26 miles through Canada. 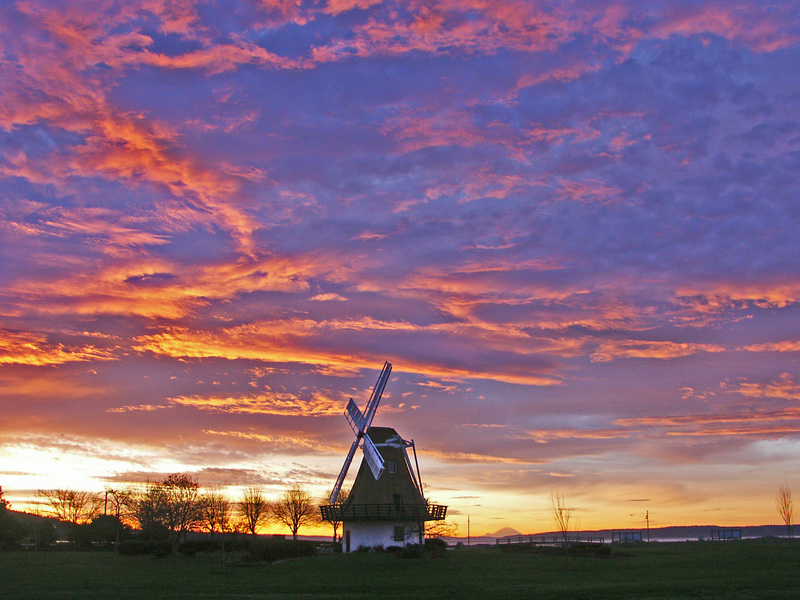 Skagit County (pop. 116,901) is north of Snohomish County. 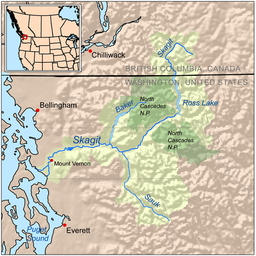 Pronounced “SKAD-jit,” it was named for the Skagit tribe, who have lived in the area for many years. The 150-mile Skagit River runs westward through the county, flowing into Puget Sound. The Skagit Valley Tulip Festival, which takes place throughout April, is one of the largest festivals in the Northwest. The county seat of Skagit County is the city of Mount Vernon (pop. 31,243). The Lincoln Theatre (1926) in Mount Vernon has a mixture of live events and movies. The theater still has its original Wurlitzer organ. The Lenning Farms Berry Barn claims to have the largest hedge maze in North America. In the city of Burlington (pop. 8,388), just north of Mount Vernon, His Place Community Church has a children’s church building shaped like Noah’s Ark. The city of Anacortes (pop. 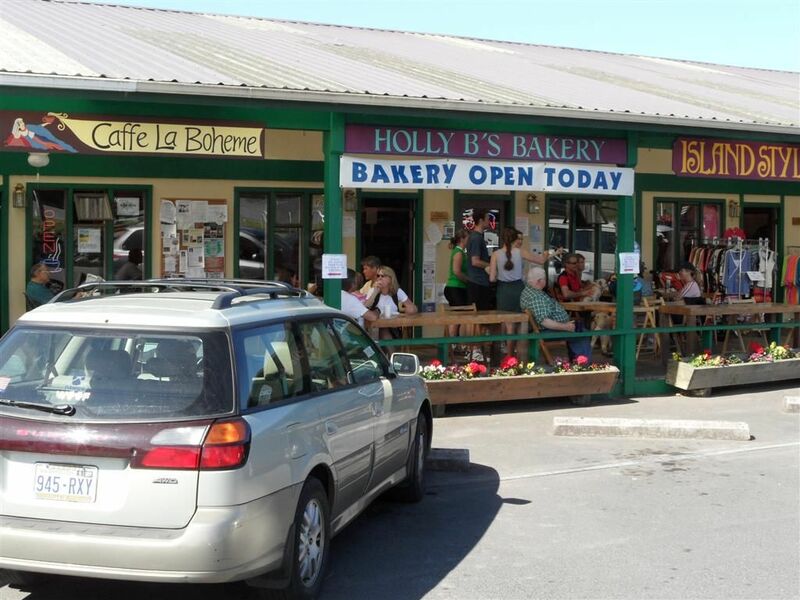 15,778), on Fidalgo Island, has ferry service to the San Juan Islands, Vancouver Island, and nearby Guemes Island. The “Lady of the Sea” statue in Anacortes shows a woman and child waiting for the return of their loved ones. East of Mount Vernon is the town of Concrete (pop. 705), which got its name because of the two cement companies in town. 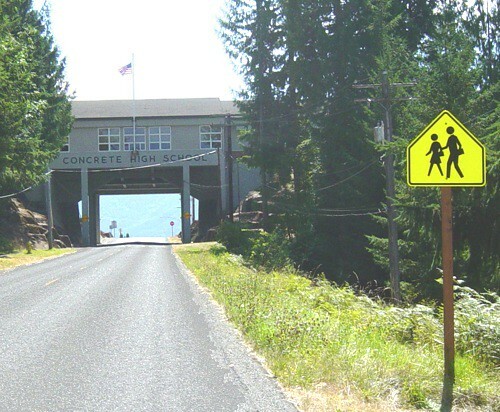 A building at Concrete High School (1952) has a road going under it. 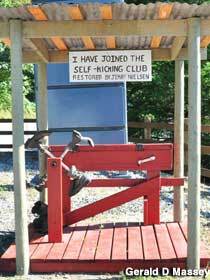 Nearby, the unincorporated community of Rockport has a “Self-Kicking Machine” at a service station along State Route 20. 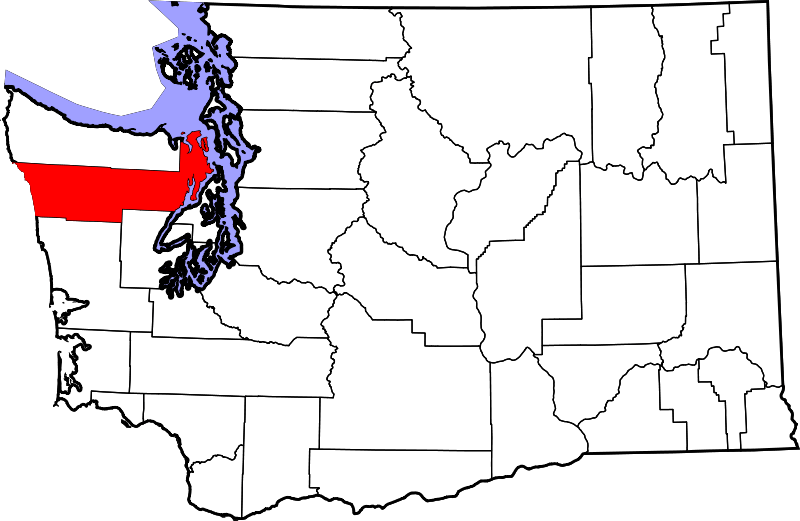 Snohomish County (pop. 713,335), north of King County, is Washington’s third-most-populous county. The highest point in Snohomish County is Glacier Peak (elev. 10,541), located in the Glacier Peak Wilderness. The county seat of Snohomish County is the city of Everett (pop. 103,019), seventh-largest city in Washington. Everett is the western terminus of the 2,571-mile U.S. Route 2. It goes east to St. Ignace, Michigan, where it runs into the Great Lakes; it starts again in Rouses Point, N.Y., and ends in Houlton, Maine. The northernmost east-west route across the U.S.
Glenn Beck, Kenny Loggins, and Sen. Henry Jackson were all born in Everett. Actor Patrick Duffy was in the Drama Club and Pep Club at Cascade High School in Everett. 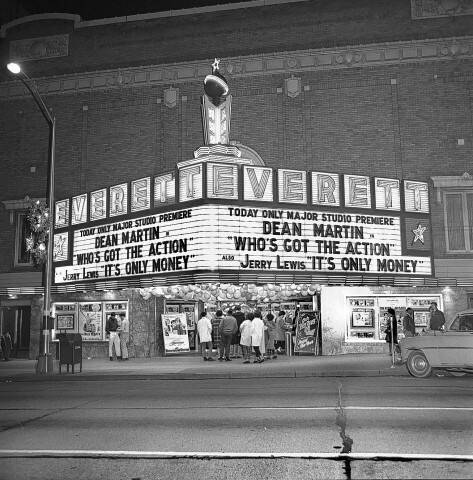 The Everett Theater (1924) has a variety of concerts, movies, and special events. The marquee is now gone. The Boeing Company is the largest employer in Everett. 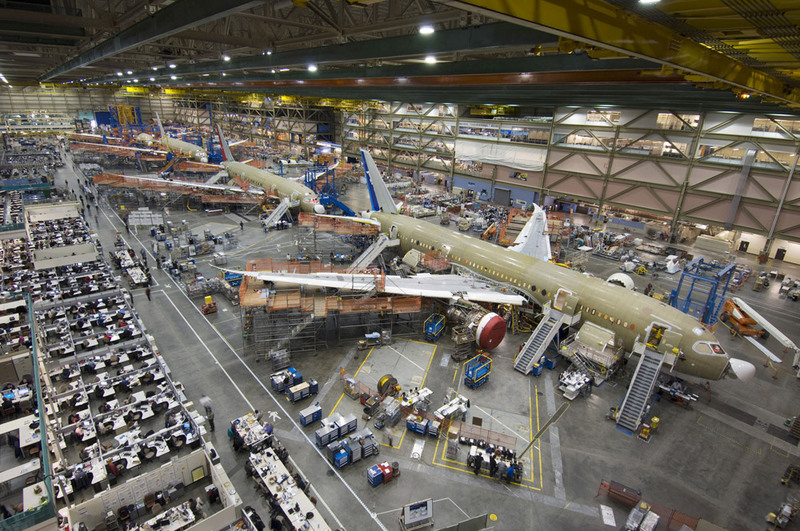 The Boeing Everett Factory is considered the largest building in the world by volume. 747s, 767s, 777s, 787s are assembled there. 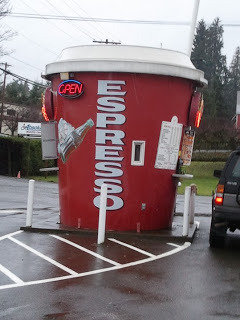 The community of Maltby, southeast of Everett, has an espresso drive-through in the shape of a tall latte cup. 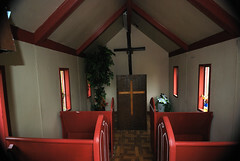 Farther east, in the community of Sultan, is tiny Wayside Chapel along Highway 2. The city of Edmonds (pop. 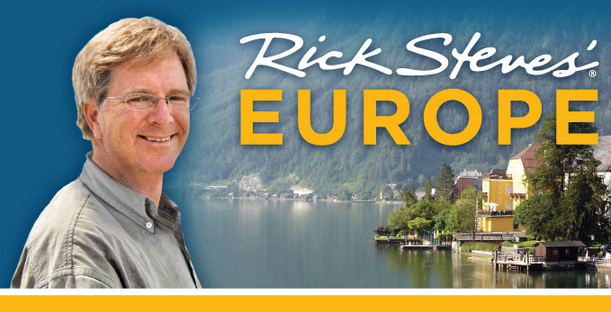 39,709) is the birthplace (1955) and home of travel writer and TV host Rick Steves. North of Everett, the community of Arlington is the home of the Outback Kangaroo Farm, which has a variety of animals including alpacas, flying squirrels, peacocks, and wallaroos. Kitsap County (pop. 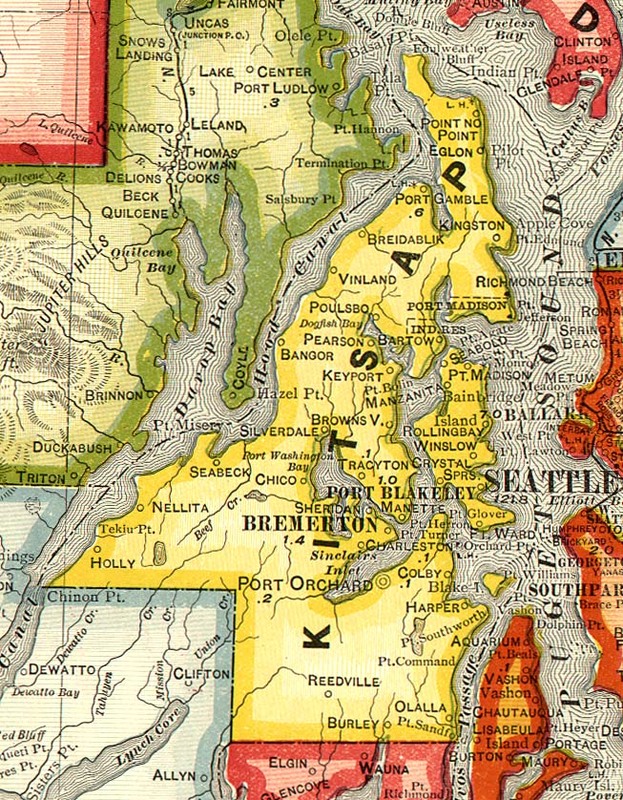 251,133) is across Puget Sound from King County and Seattle. Its population has grown from 101,732 in 1970. 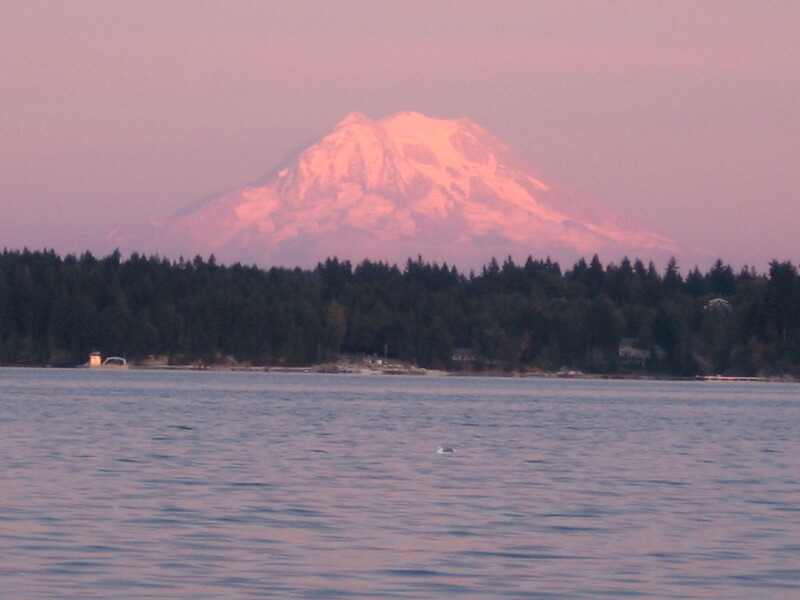 The county includes most of the Kitsap Peninsula, as well as Bainbridge Island and Blake Island. 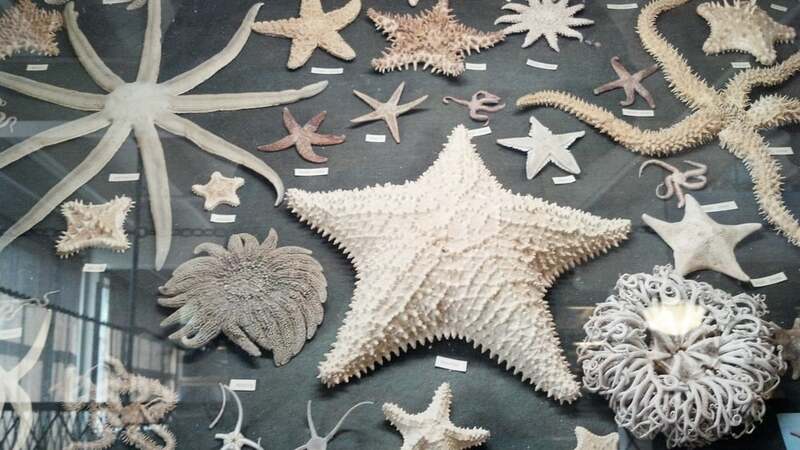 It has more than 250 miles of saltwater shoreline. Ferries serve Bremerton, Bainbridge Island, Southwork, and Kingston. 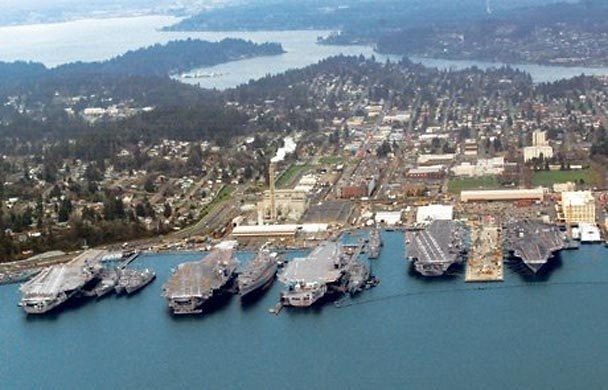 The county’s largest employer is the U.S. Navy, with Puget Sound Naval Shipyard, Naval Undersea Warfare Center, and Naval Base Kitsap. The shipyard is in Bremerton. The county seat of Kitsap County is the city of Port Orchard (pop. 11,144). The largest city in Kitsap County is Bremerton (pop. 37,729), located across Sinclair Inlet from Port Orchard. 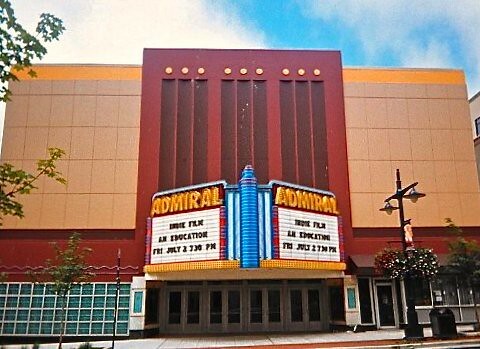 The Admiral Theatre in downtown Bremerton opened in 1942. It has a mixture of concerts and movies. Bill Gates, Sr., was born in Bremerton and graduated from Bremerton High School before attending the University of Washington in Seattle. The city of Poulsbo (pop. 9,200), north of Bremerton, was settled by many Norwegians and Swedes and has a Scandinavian theme today. The city has a 12-foot Viking statue and an annual Viking Fest. The community of Port Gamble, a former company town for the Puget Mill Company, has one of the world’s largest collections of seashells at the Of Sea and Shore Museum. King County (pop. 1,931,249) is Washington’s most-populous county and the 14th-most-populous county in the U.S. The only other King County is in Texas. 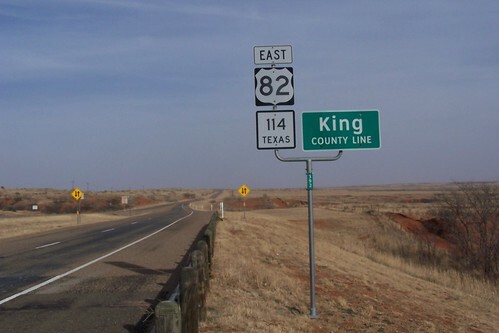 With a population of 286, it is the second-smallest county in Texas and the third-smallest in the U.S.
King County, Washington, was originally named for Vice President William R. King (1786-1853). In 2005, the county was officially renamed for the Rev. Martin Luther King, Jr. (1929-1968). The county seat of King County is Seattle (pop. 608,660), largest city in Washington and 21st-largest city in the U.S. 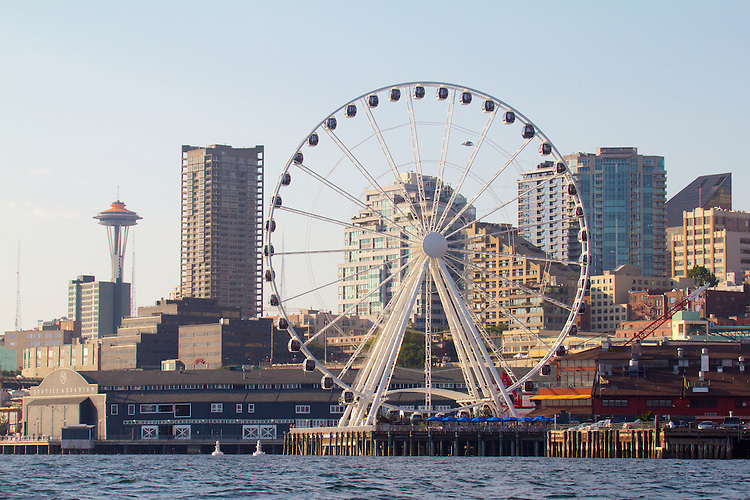 The Seattle Great Wheel opened in 2012. 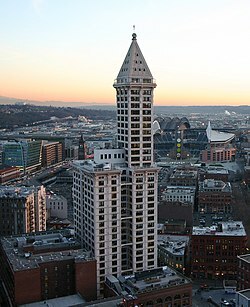 The 38-story Smith Tower in Pioneer Square was the tallest building on the West Coast from 1914 until the Space Needle opened in 1962. It has a public observation deck. Nearby, in Pioneer Square, is a visitors’ center for the Klondike Gold Rush National Historical Park. The other units of the park are in Skagway, Alaska; they join with parks in Canada to form the Klondike Gold Rush International Historical Park. 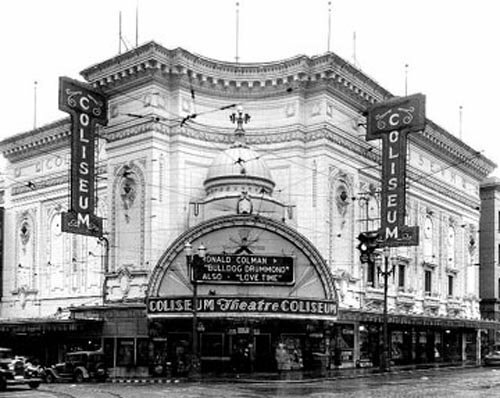 The Coliseum Theater (1916) was Seattle’s first theater built specifically for movies, and one of America’s first movie palaces. It was renovated as a Banana Republic clothing store in 1995. It showed movies until 1990. 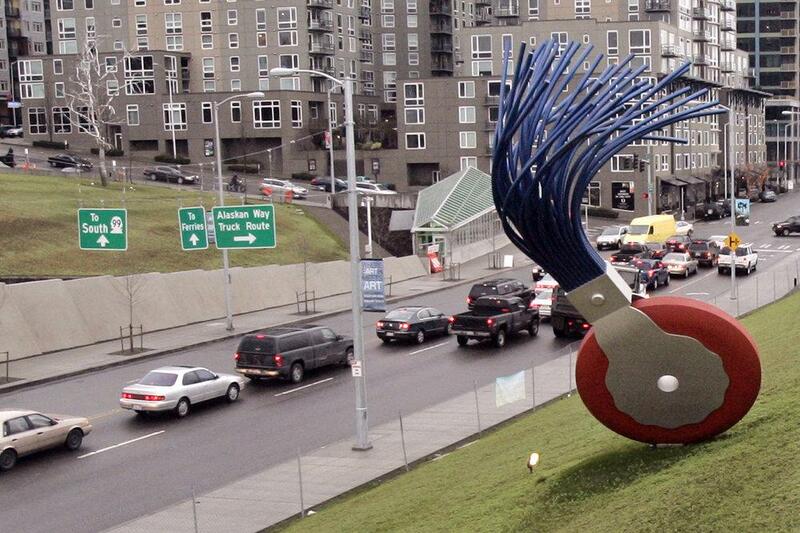 The Olympic Sculpture Park (2007), an outdoor sculpture museum, is well-known for its giant typewriter eraser. 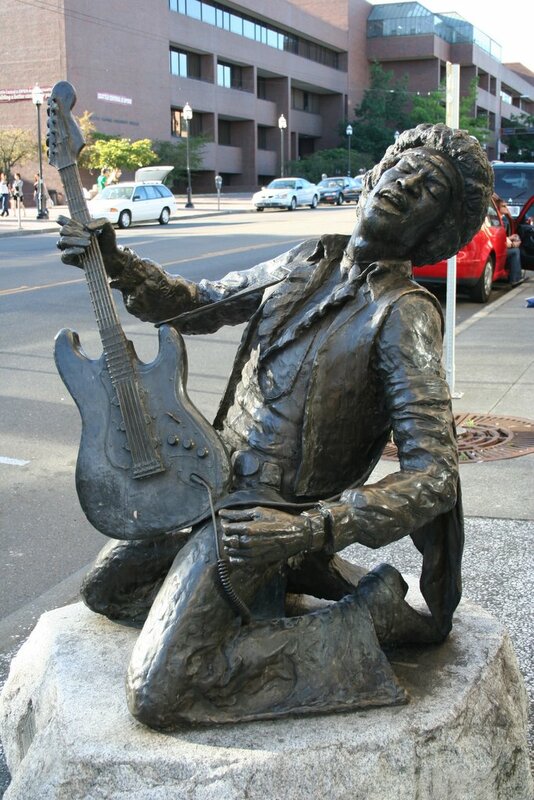 Rock musician Jimi Hendrix (1942-1970) grew up in Seattle. A bronze statue is in the Capitol Hill area. King Street Station (1906), just south of downtown, serves Amtrak’s “Coast Starlight,” “Empire Builder,” and “Cascades” trains, as well as Sounder commuter trains north to Everett and south to Tacoma. 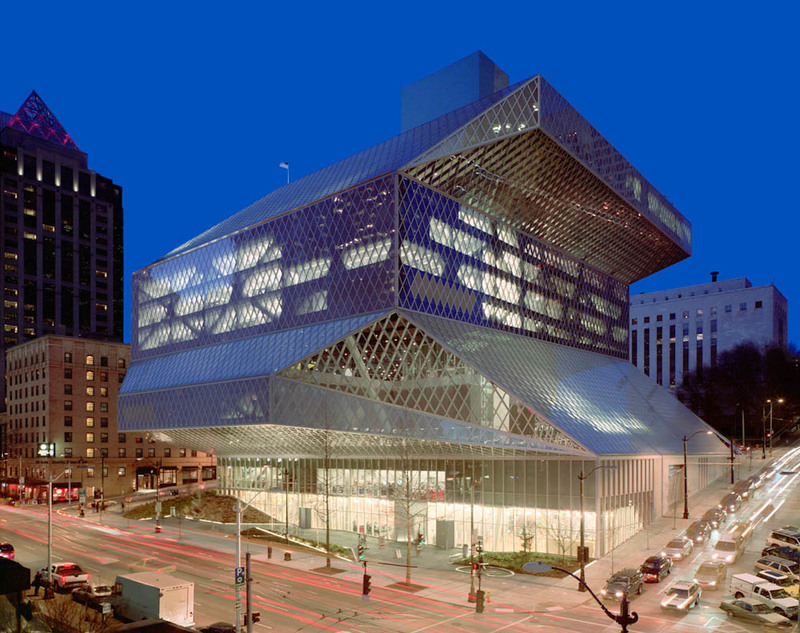 The 11-story Seattle Central Library opened in 2004. Seattle has an accordian museum, inside the Petosa Accordians shop. The Gum Wall is under the popular Pike Place Market. People have been sticking their used chewing gum there for more than 20 years. In Kenmore (pop. 20,460), just north of Seattle, the Saint Edward Seminary operated from 1931 to 1976. 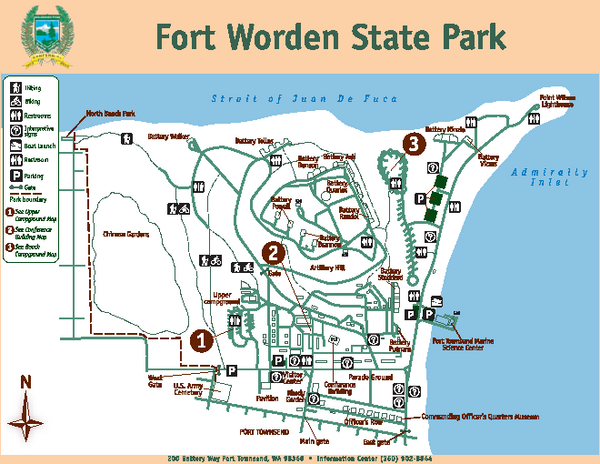 The seminary is now part of Saint Edward State Park. The building is mostly inaccessible to the public. The city of Snoqualmie (pop. 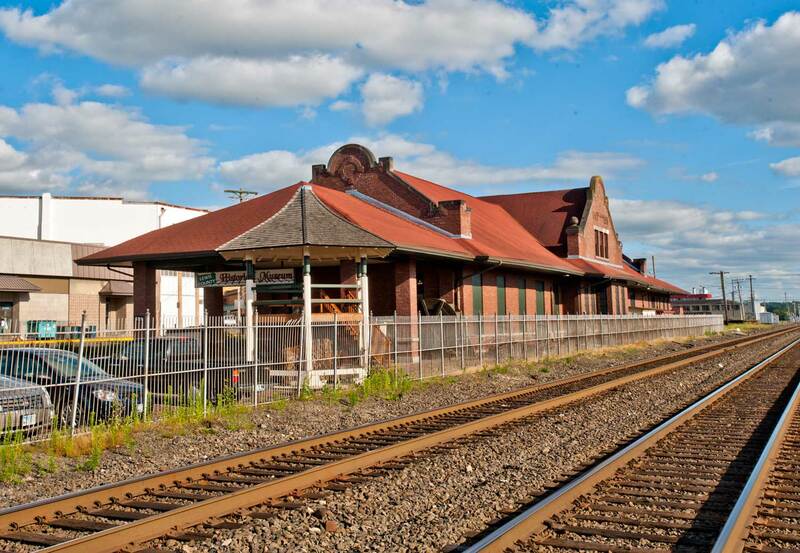 10,670) is the home of the Northwest Railway Museum and its five-mile heritage railroad. Pierce County (pop. 795,225) is Washington’s second-most-populous county. It is one of five Pierce counties, and one of the four named for President Franklin Pierce (1804-1869). 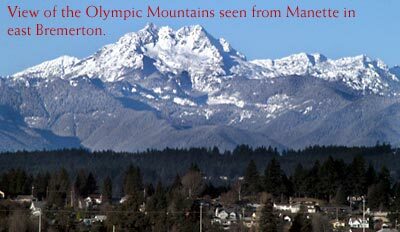 The county stretches from the southern end of Puget Sound to the crest of the Cascades, including Mount Rainier – at 14,411 feet, the tallest mountain in Washington and the highest point in the Cascades. 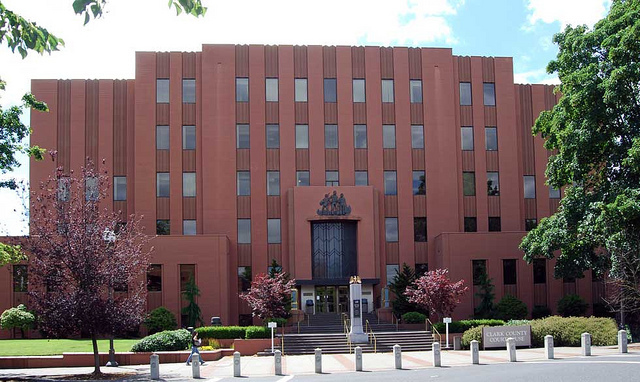 The county seat of Pierce County is the city of Tacoma (pop. 198,397), third-largest city in Washington. 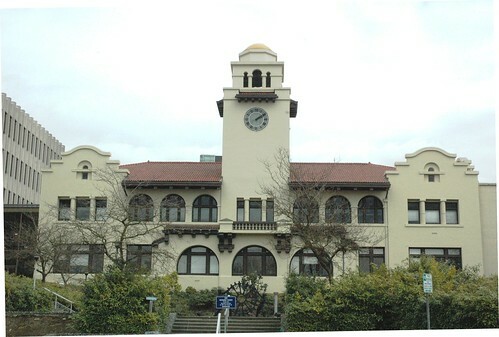 Tacoma’s former Union Station (1911) is now a courthouse for the United States District Court for the Western District of Washington. The rotunda is popular for weddings. 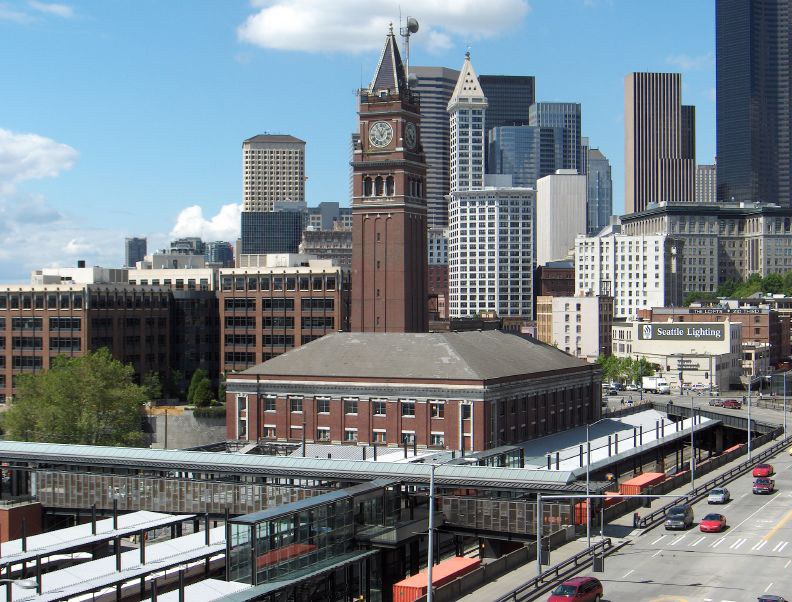 Tacoma is served by Amtrak (north to Seattle and south to Los Angeles), Sounder commuter rail (north to Seattle), and the 1.6-mile Tacoma Link light rail, which connects the Tacoma Dome with downtown. 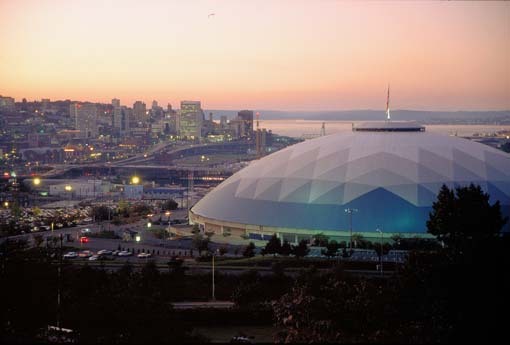 Tacoma Dome opened in 1983. 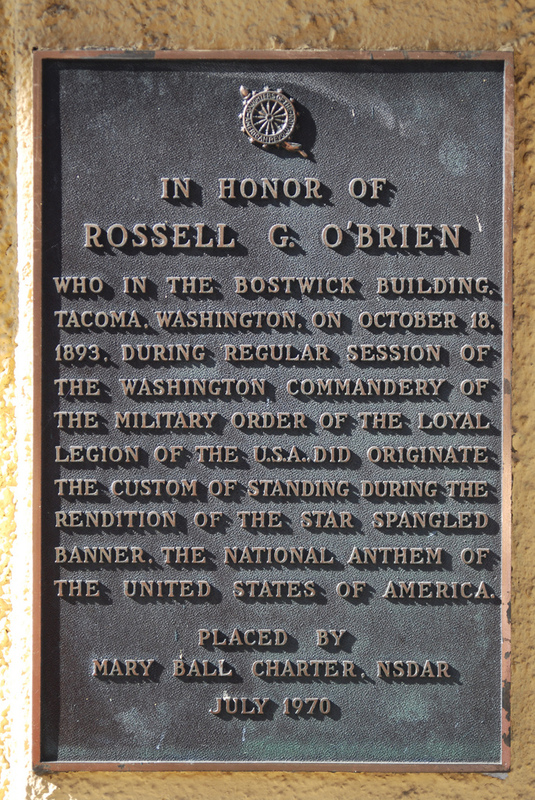 The tradition of standing for “The Star-Spangled Banner” was begun in Tacoma in 1893 by Russell G. O’Brien. Tacoma’s downtown Theater District includes the Pantages (1918) the Rialto (1918), and the Theater on the Square (1993). The Tacoma Symphony Orchestra plays at the Rialto. Bob’s Java Jive, southwest of downtown, serves coffee inside a giant coffee pot. The building dates from 1927. Stadium High School, north of downtown, is the home of the Stadium Bowl (1910), which has one of the most spectacular settings of any football field in the country. The stadium looks out on Commencement Bay. 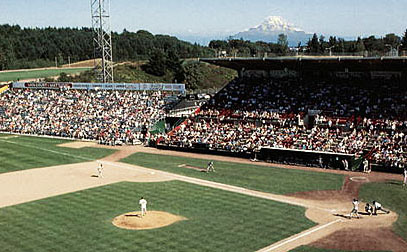 The Tacoma Rainiers, Triple-A Pacific Coast League affiliate of the Seattle Mariners, play at Cheney Stadium (1960). The 702-acre Point Defiance Park, north of downtown, includes a zoo and an aquarium. About half of the commercial rhubarb grown in the U.S. comes from Pierce County. In Mount Rainier National Park, seven comfort stations from the 1930s and ’40s are on the National Register of Historic Places. Thurston County (pop. 252,264), one of two Thurston counties in the U.S., is north of Lewis County. It was named for Samuel R. Thurston, the Oregon Territory’s first delegate to Congress. The city of Olympia (pop. 46,478) is both the county seat of Thurston County and the capital of Washington. The Old State Capitol, which served as Washington’s capitol building from 1905 to 1928 (and previously as the county courthouse), is now the office of the state Superintendent of Public Instruction. Capitol Lake is an artificial lake in Olympia, just west of the Capitol. The Capitol Theater, built in 1924, is now operated by the Olympia Film Society. 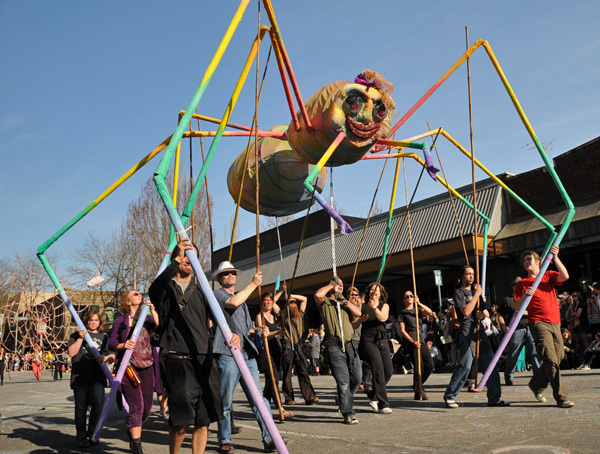 Olympia has an annual Earth Day celebration called The Procession of the Species. The parade has a variety of animal themes and does not allow live pets, motorized vehicles, or words. The Evergreen State College is a public liberal arts college in Olympia. Founded in 1967, it has about 4,500 students. Cartoonist Matt Groening (center) attended Evergreen. Just south of Olympia, the city of Tumwater (pop. 17,371) was the longtime home of the Olympic Brewery, along Interstate 5. Brewery operations at the plant ended in 2003. It was well-known for its tours. Mima Mounds Natural Area Preserve is southwest of Olympia. 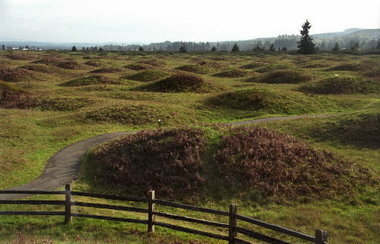 Mima mounds are low, circular mounds of undermined origin. Lewis County (pop. 75,455) is north of Cowlitz and Skamania counties. It is one of seven Lewis counties, and one of five named for Meriwether Lewis (1774-1809), leader of the Lewis and Clark Expedition. Most of the population of Lewis County is in the Interstate 5 corridor, in the western part of the county. The eastern part of the county is in the Cascades, including a portion of Mount Rainier National Park. The county seat of Lewis County is the city of Chehalis (pronounced “shuh-HAY-lis”), which has a population of 7,259. The old Northern Pacific Depot (1912) in Chehalis is now the Lewis County Historical Museum. 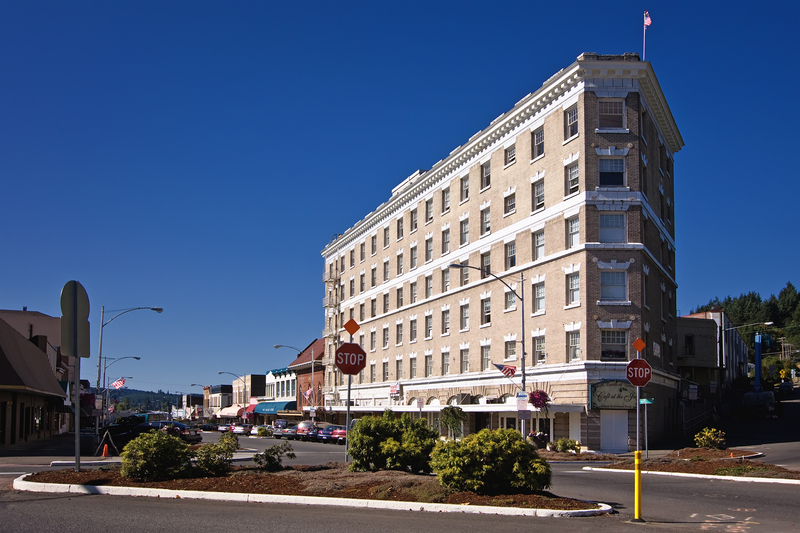 The former St. Helens Hotel (1920) in downtown Chehalis is now the St. Helens Apartments. 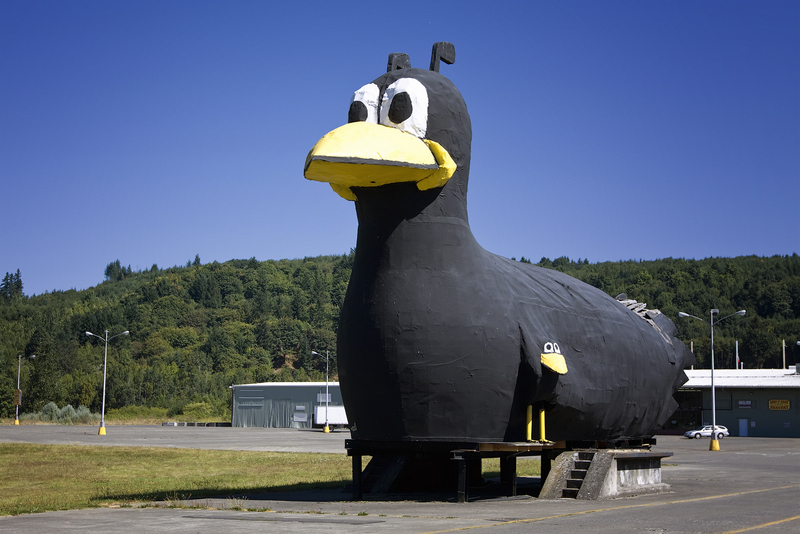 On the north side of Chehalis is a “Yard Bird” statue, left over from a well-known local chain of Yard Bird stores that has gone out of business. Centralia (pop. 16,336), the largest city in Lewis County, is just four miles north of Chehalis. 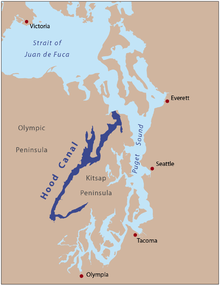 It got its name because of its central location between Seattle and the Columbia River. 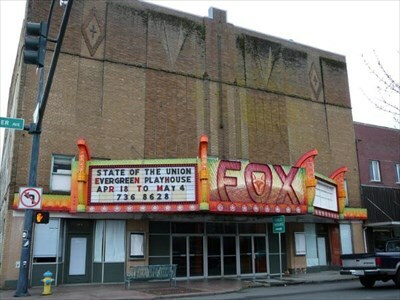 The renovated Fox Theatre (1930) in Centralia hosts classic movies and special events. 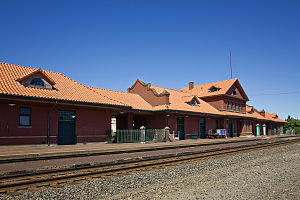 The Amtrak station in Centralia is the former Union Depot (1912). It is served by Amtrak’s “Cascades” and “Coast Starlight” trains. 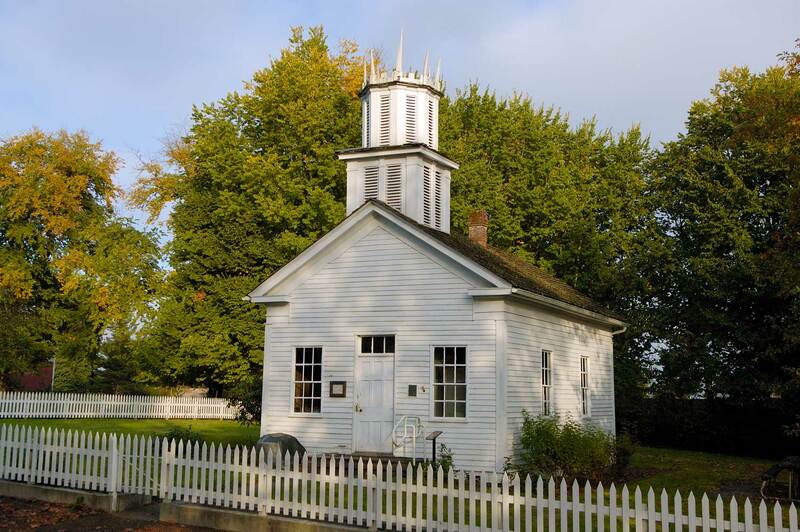 In the community of Claquato, west of Chehalis, the Claquato Church (1857) is the oldest standing church building in Washington. Claquato was briefly the county seat. The city of Winlock (pop. 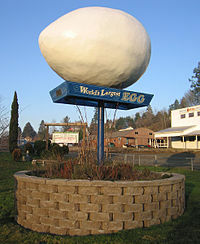 1,329), south of Chehalis, is the home of “The World’s Largest Egg” – as reported in “Ripley’s Believe It or Not” in 1989. The egg industry has been important in the area. This one dates from 1991. Wahkiakum (wuk-EYE-uh-kum) County is west of Cowlitz County, along the Columbia River. Its population of 3,978 is second-smallest in Washington, and it is third-smallest in square miles. 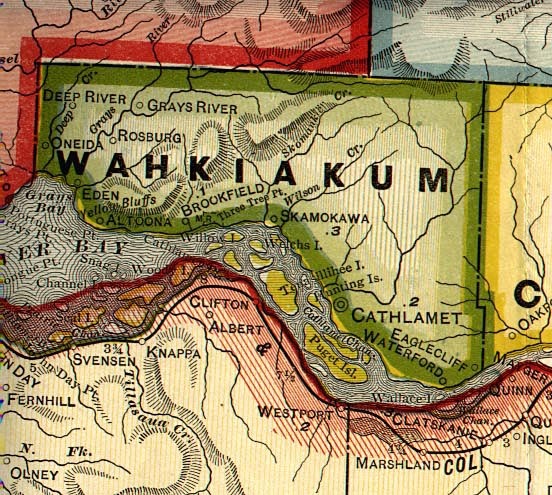 The county was named for Wahkiakum (“Tall Timber”), a 19th-century chief of the Chinook Indians. The county seat of Wahkiakum County, and the smallest county seat in Washington, is the town of Cathlamet (pop. 532). Cathlamet was the site of one of the largest Indian villages on the Columbia River west of the Cascades. A highway bridge connects Cathlamet to Puget Island, and the Wahkiakum County Ferry connects Puget Island to Westport, Oregon. The ferry holds nine cars and takes about 10 minutes to cross the Columbia. It’s the last scheduled ferry between Washington and Oregon. Cathlamet has a Bald Eagle Days celebration every July. Several movies have been filmed in Cathlamet, includent “Snow Falling on Cedars” (1999). The Mount St. Helens Visitor Center, which opened in 1987, is in the northern part of the county. Part of the Mount St. Helens National Volcanic Monument is in the northeastern corner of the county. The mountain itself is in Skamania County. 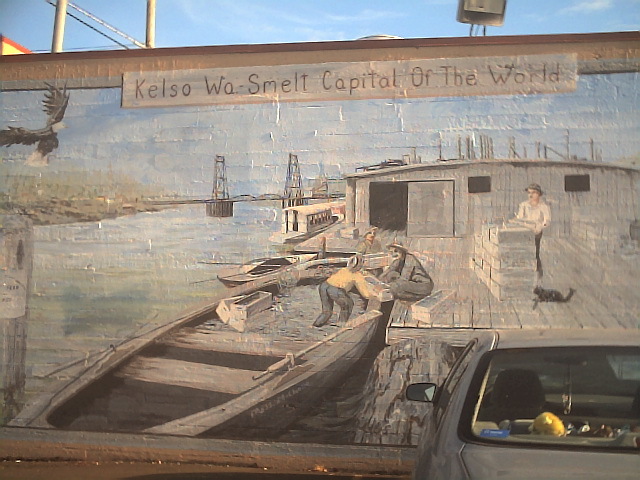 The county seat of Cowlitz County is the city of Kelso (pop. 11,925), located near the confluence of the Cowlitz and Columbia rivers. In 1998-99, the slow-moving Aldercrest-Banyon landslide caused the evacuation and condemnation of 127 homes in Kelso. 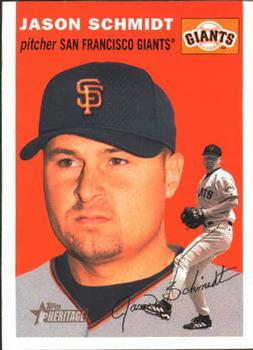 Major League pitcher Jason Schmidt starred for Kelso High School before playing professional baseball. The largest city in Cowlitz County is Longview (pop. 36,648), across the Cowlitz River from Kelso. Longview was a planned city, built by timber baron Robert A. 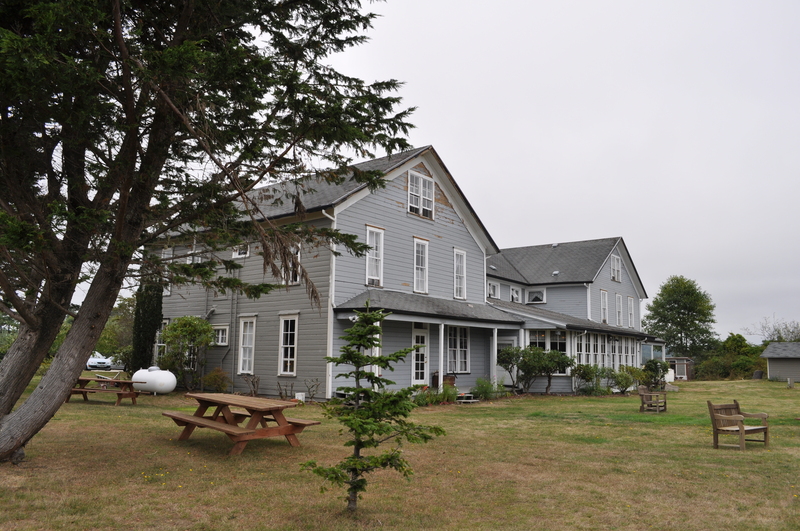 Long in the early 1920s to house lumber mill workers for the Long-Bell Lumber Company. The Lewis and Clark Bridge (1930) crosses the Columbia River between Longview and Rainier, Oregon. The Green Day song “Longview” was the fourth track on the band’s third album, “Dookie.” It was Green Day’s debut single. 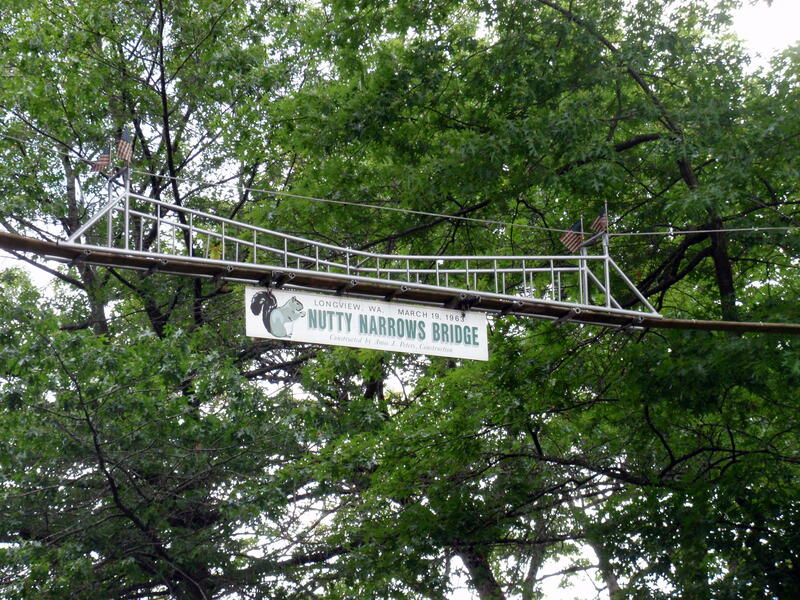 The “Nutty Narrows Bridge” is a 60-foot squirrel bridge that crosses Olympia Way in downtown Longview. It dates from 1963. Clark County (pop. 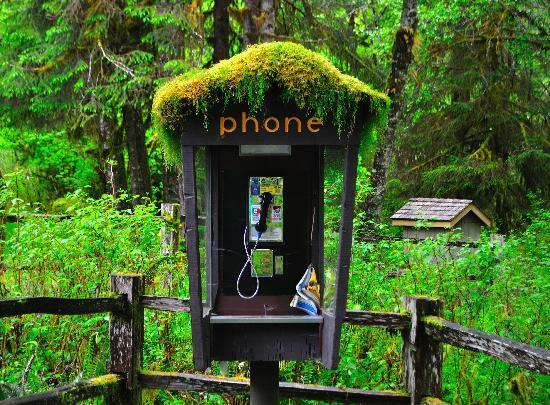 425,363) is bordered on the west and south by the Columbia River, and on the north by the Lewis River. It is Washington’s fifth-most-populous county. 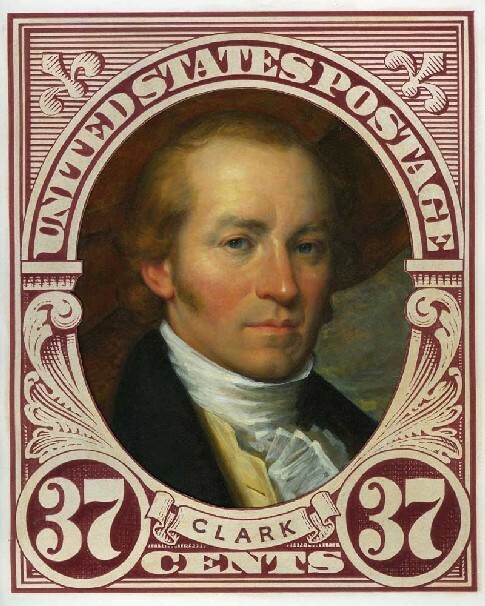 It is one of 12 Clark counties in the U.S., and one of three (along with Arkansas and Missouri) named for William Clark (1770-1838) of the Lewis and Clark Expedition. The county seat of Clark County is the city of Vancouver (pop. 161,791), fourth-largest city in Washington, located across the Columbia from Portland, Oregon. English settlement of the Vancouver area began in 1824 at Fort Vancouver, a fur-trading outpost of the Hudson’s Bay Company. 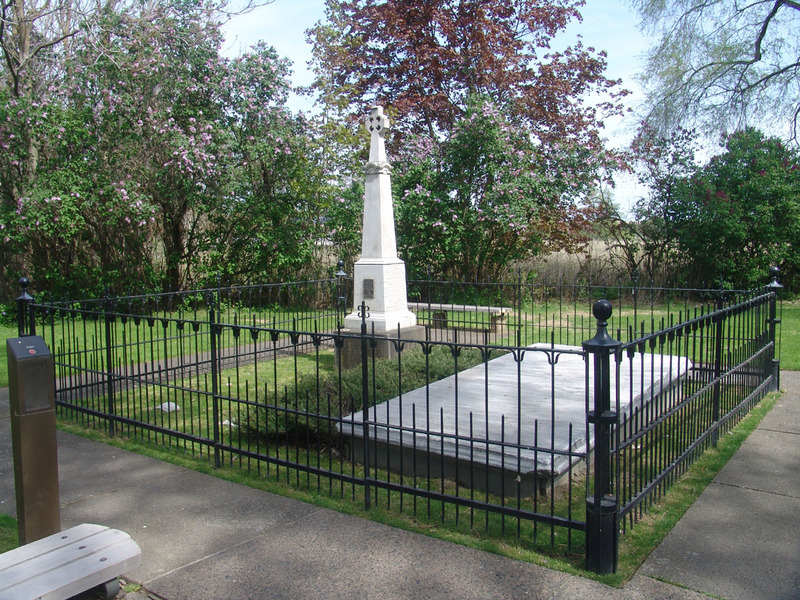 It was named for naval officer and explorer George Vancouver (1757-1798). Vancouver, B.C., was named later in the 19th century. Vancouver’s population grew rapidly during World War II, when Henry Kaiser built a shipyard that employed as many as 36,000 people. 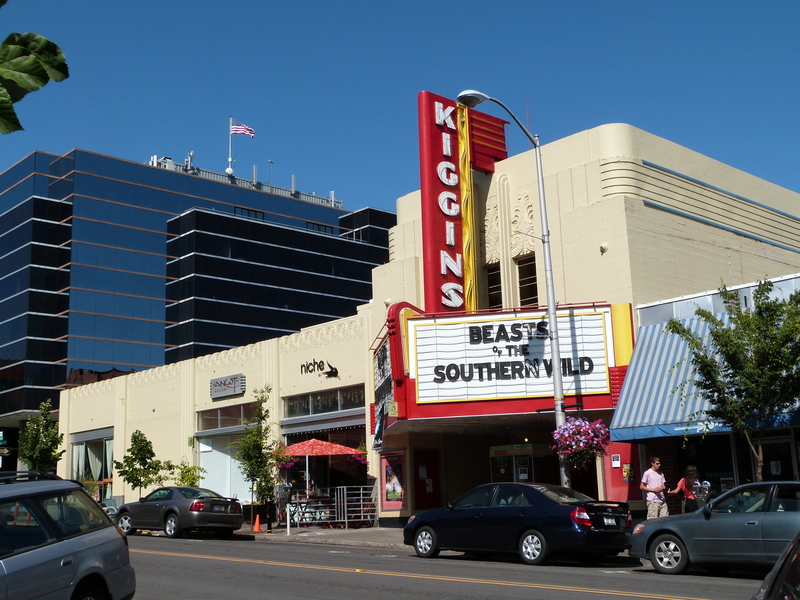 The Kiggins Theatre opened in downtown Vancouver in 1936. It now has variety of films, concerts, and special events. The city of Ridgefield (pop. 4,763), northwest of Vancouver, is the home of the Arndt Prune Dryer (1898), one of the last traditional, farm-built prune dryer building in Washington. The athletic teams at Ridgefield High School are known as the Spudders, because of the region’s potato-growing heritage. In the city of Camas (pop. 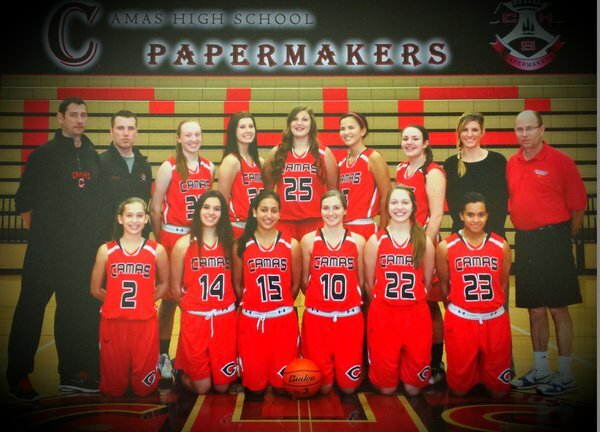 19,355), east of Vancouver, the sports teams at Camas High School are called the Papermakers, because of its large Georgia-Pacific paper mill. Richie Sexson, the tallest position player in Major League history (at 6’8″), grew up in the unincorporated community of Brush Prairie, north of Vancouver. Much of the county is in Pinchot National Forest. Mount St. Helens is in the northern part of Skamania County. St. Helens last erupted in 1980, causing massive destruction and the deaths of 57 people. The summit was reduced from 9,677 feet to 8,365 feet elevation. Today, the mountain is part of Mount St. Helens National Volcanic Monument. Visitors may drive within four miles of the crater. Mountain climbing is now allowed. The county seat of Skamania County is the city of Stevenson (pop. 1,465). 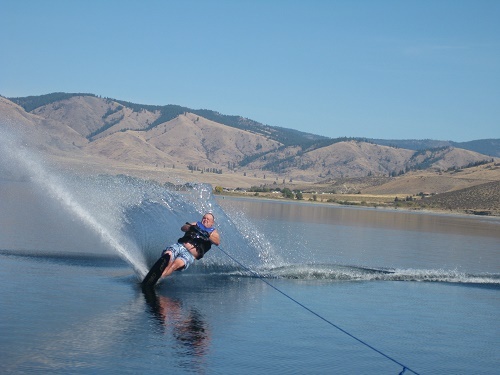 Stevenson is in the Columbia Gorge – an area that is extremely popular for windsurfing and kiteboarding. The Columbia Gorge Interpretive Center Museum, in Stevenson, has a variety of exhibits about local history. 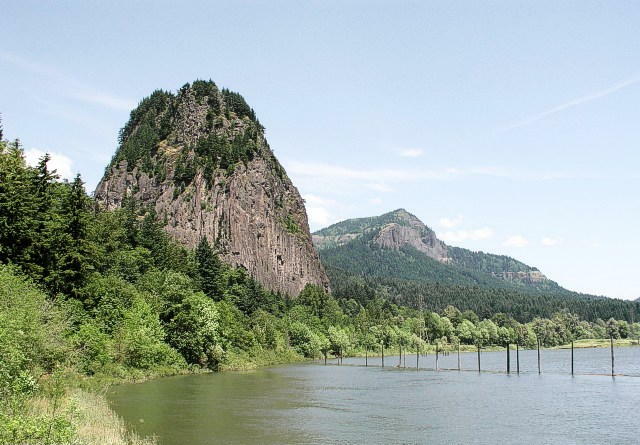 Beacon Rock State Park is west of Stevenson; the 848-foot-tall rock has long been a landmark on the Columbia River. 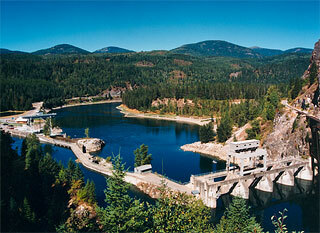 The Bonneville Lock and Dam, which opened in 1937, crosses the Columbia to Oregon. 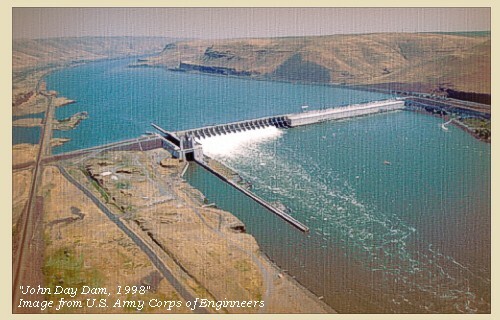 Built and managed by the Army Corps of Engineers, it is a major producer of electricity. Klickitat County (pop. 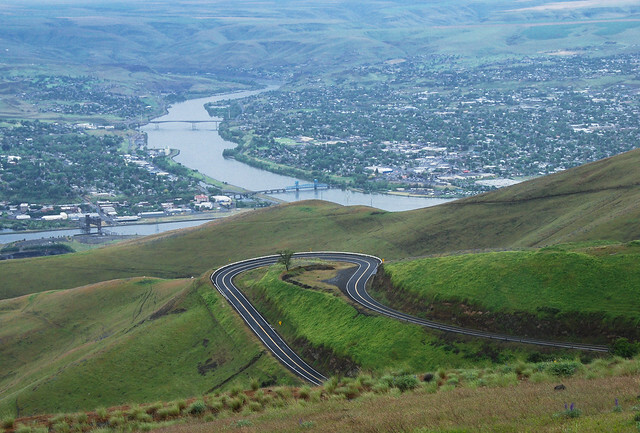 20,318) is south of Yakima County, along the Columbia River. 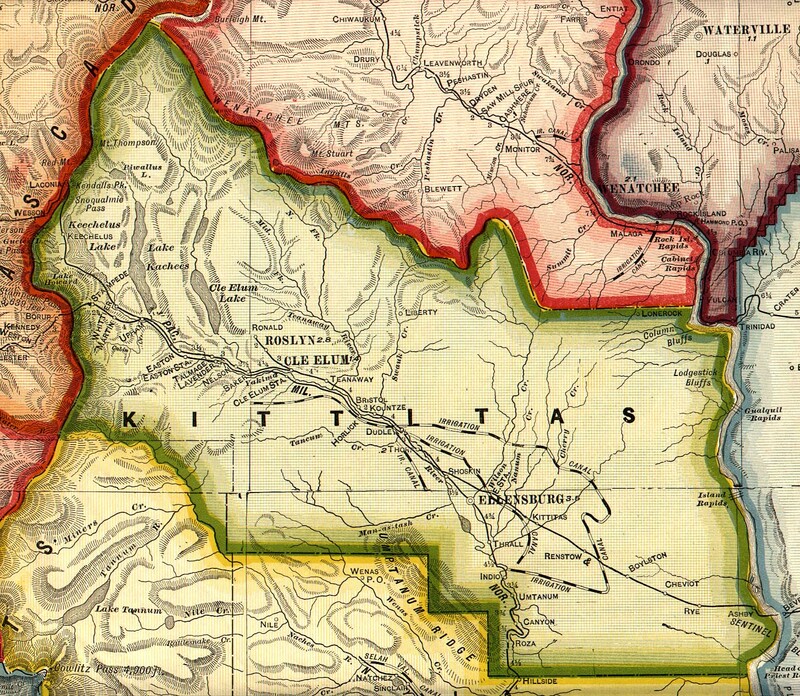 The county was named for the Klickitat tribe of Yakama Native Americans. The John Day Dam (1971) crosses the Columbia between Klickitat County and Oregon. Lake Umatilla is the reservoir behind the dam, which is the newest dam on the lower Columbia. The county seat of Klickitat County is the city of Goldendale (pop. 3,407), located in the Klickitat Valley, a few miles north of the Columbia. 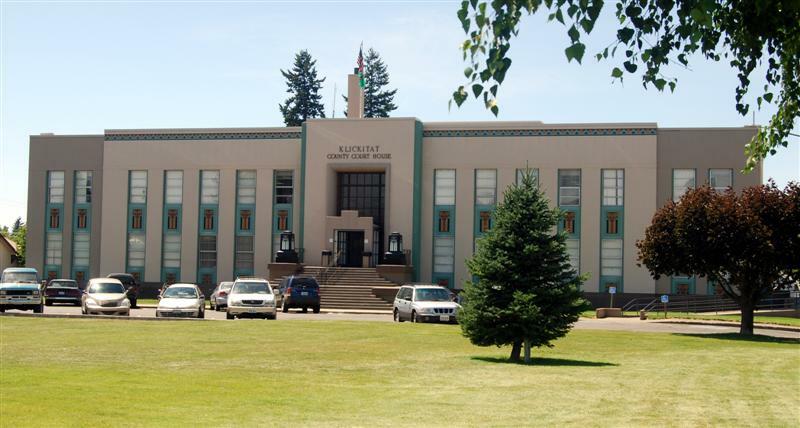 The Klickitat County Courthouse was built in 1941. 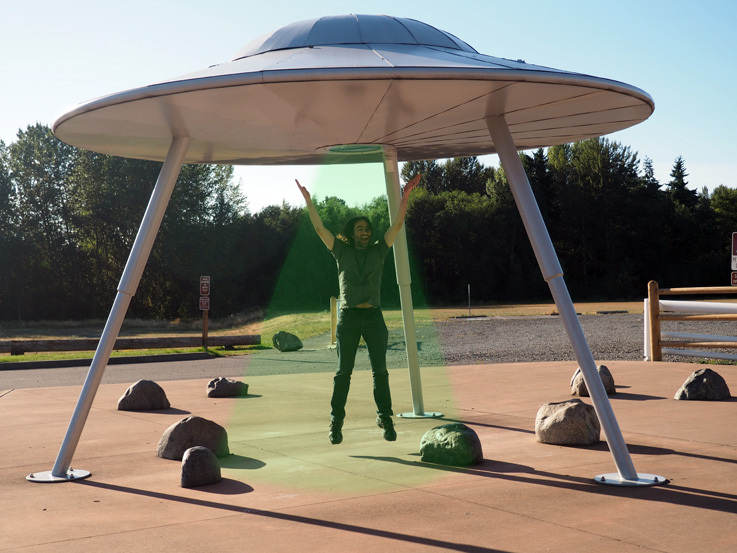 Goldendale Observatory State Park is just north of town. The observatory dates from 1973. The city of White Salmon (pop. 2,193), on the Columbia, has the slogan “The Land Where the Sun Meets the Rain” because it’s between the wet Cascades and the dry Columbia Basin to the east. 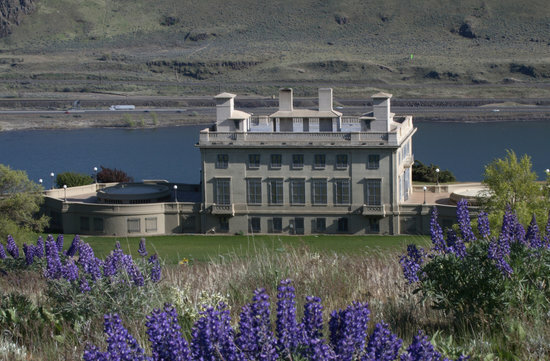 The Maryhill Museum of Art, on a bluff above the Columbia, was built in 1914 as a mansion for entrepreneur Samuel Hill. It opened as a museum in 1940. The collection includes sculptures by Auguste Rodin. The museum property includes a replica of Stonehenge, built in 1929. Yakima County (pop. 243,231) is south of Kittitas County. It is Washington’s second-largest county in square miles. The Yakama Indian Reservation makes up about 36 percent of the county. 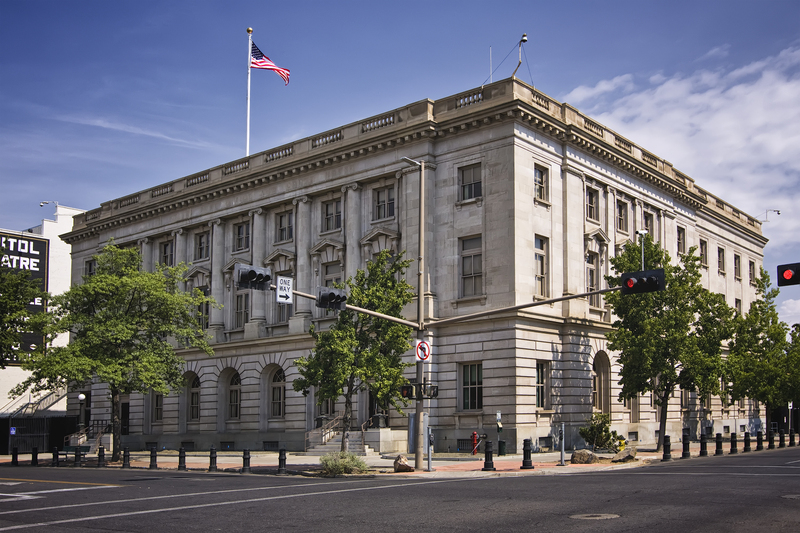 The county seat of Yakima County is the city of Yakima (pop. 91,067), located on the 214-mile Yakima River, a tributary of the Columbia. William O. Douglas (1898-1980), longest-serving justice on the U.S. Supreme Court (36 years), grew up in Yakima and was valedictorian at Yakima High School. 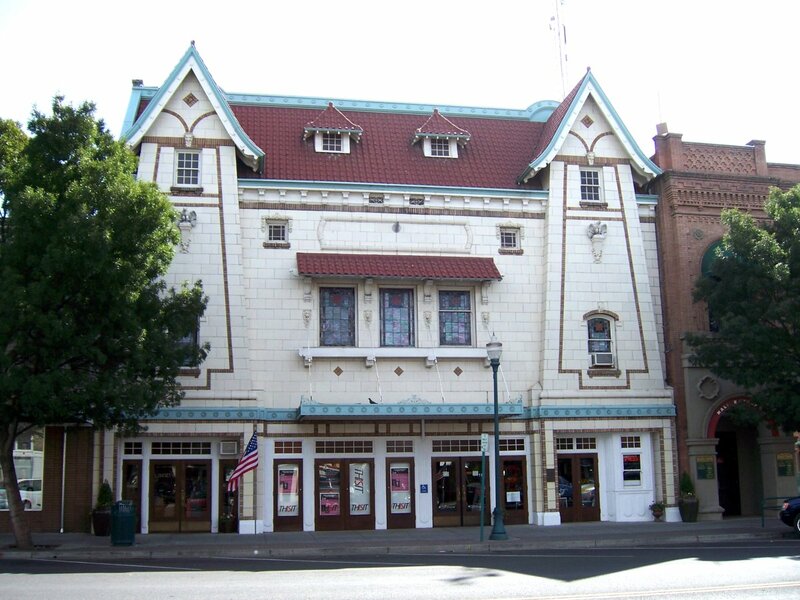 The Capitol Theatre in downtown Yakima opened in 1920 as the Mercy Theatre. It is now the home of the Yakima Symphony Orchestra. 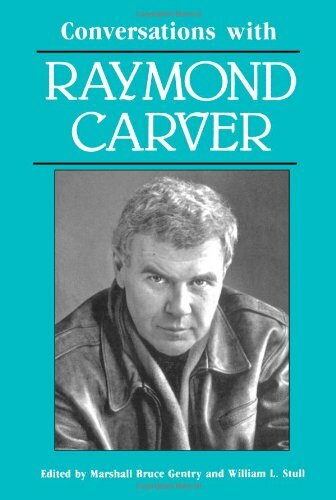 Author Raymond Carver (1938-1988) grew up in Yakima and graduated from Yakima High School. Singer Gary Puckett grew up in Yakima and named his band Gary Puckett and the Union Gap (in 1967) for the nearby city of Union Gap. That’s Gary in the middle. 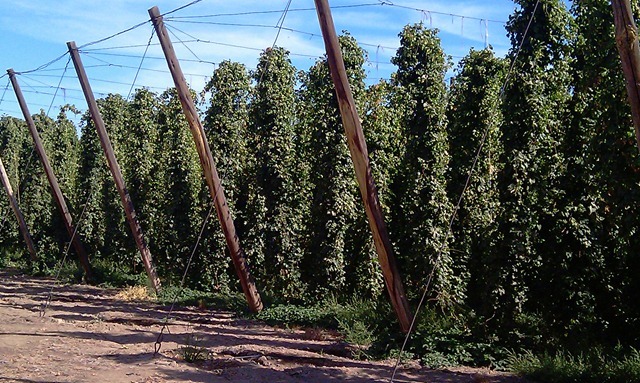 Farms in the Yakima Valley, irrigated by the Yakima River, raise products such as grapes (about 50 wineries), apples, cherries, and about 75 percent of the hops grown in the U.S.
Southeast of Yakima, the city of Zillah (pop. 2,964) is the home of the Christian Worship Center – also known as the Church of God-Zillah. 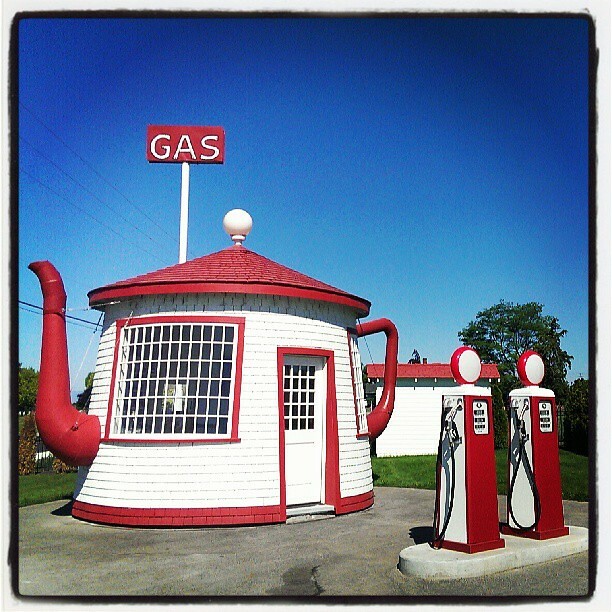 Also in Zillah is the former Teapot Dome Service Station (1922). Nearby, the city of Granger (pop. 3,246) has a collection of about 30 cement dinosaur sculptures, scattered around town. Mount Adams (12,281 feet), second-tallest mountain in Washington, is in western Yakima County. It hasn’t erupted for 1,400 years. Kittitas County (pop. 40,915) is south of Chelan County. It’s the only Kittitas County in the U.S. The county is bordered on the east by the Columbia River and on the west by the Cascades. 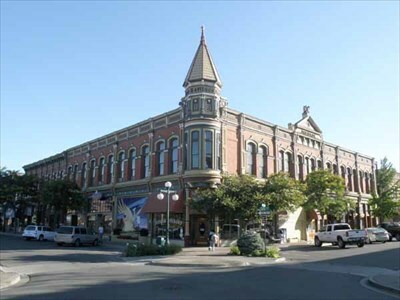 The county seat of Kittitas County is the city of Ellensburg (pop. 18,174). Downtown Ellensburg has a statue of a bull sitting on a bench, sculpted in 1986. 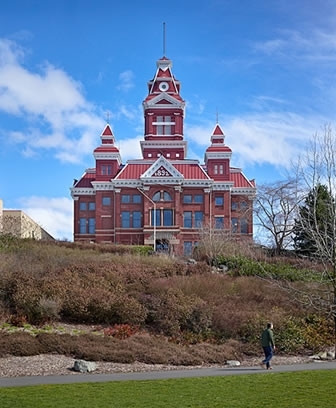 Ellensburg is the home of Central Washington University, founded in 1890 as the Washington State Normal School, for the training of teachers. 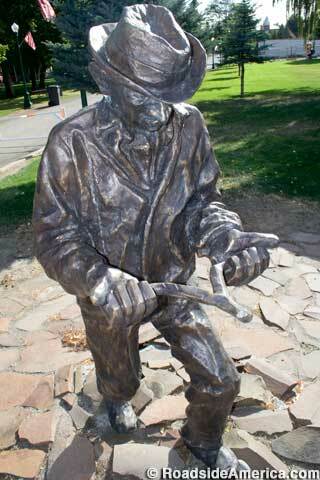 Downtown Ellensburg also has a statue of Washoe, the first chimpanzee to communicate with American Sign Language. 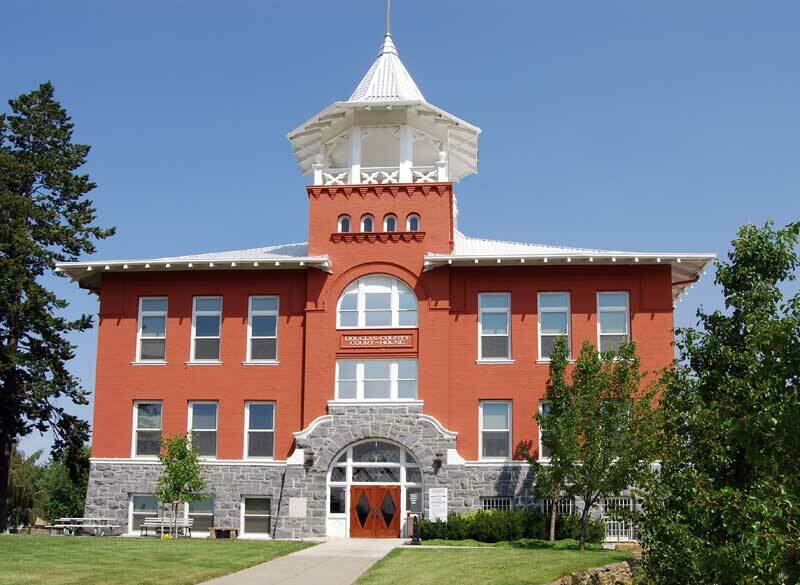 Washoe lived at Central Washington University for many years. Washoe died in 2007 at age 42. Ellensburg’s annual Dachshunds on Parade event takes place in June. 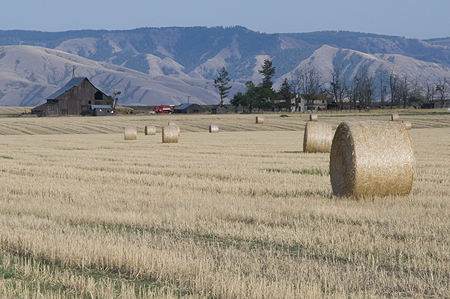 Olmstead Place State Park, east of Ellensburg, is a 217-acre working pioneer farm. 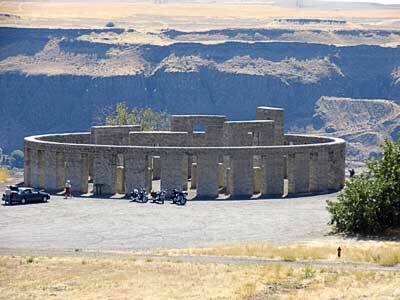 Farther east, near the Columbia River, is the Ginkgo Petrified Forest State Park. Just outside the park is the Ginkgo Gem Shop, with its collection of dinosaurs. 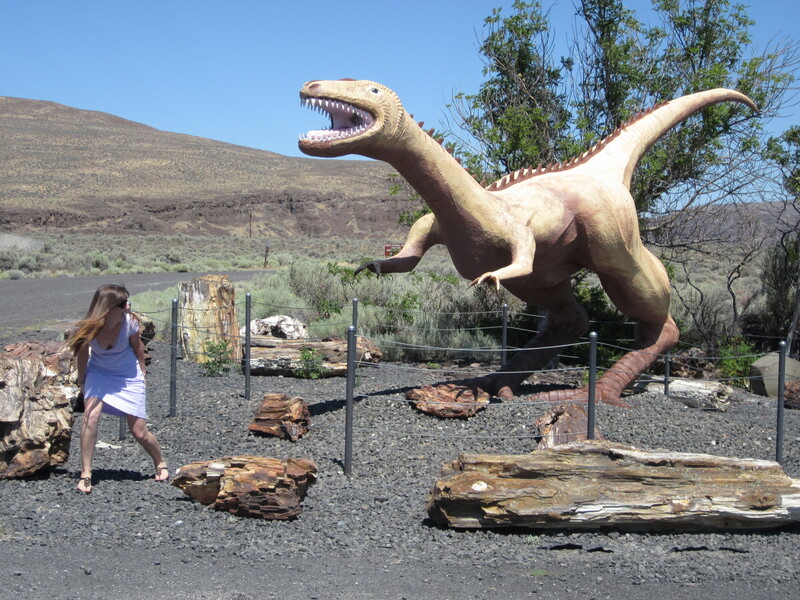 No dinosaur fossils have been found in Washington. West of Ellensburg, in the town of South Cle Elum (pop. 532), the former Milwaukee Road bunkhouse (1909) is now the Iron Horse Inn Bed and Breakfast. The former coal company town of Roslyn (pop. 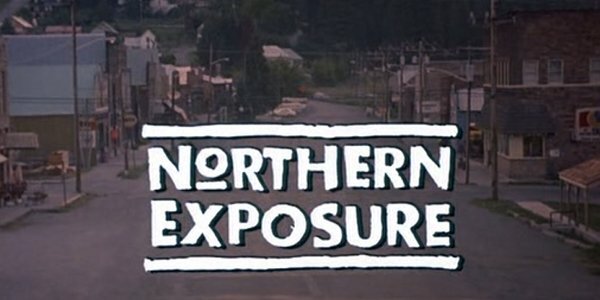 900) was the real-life setting for the TV show “Northern Exposure” from 1990-95. Roslyn stood in for the fictional town of Cicely, Alaska. Lake Chelan, 50 miles long and about one mile wide, is Washington’s largest natural lake. It has a maximum depth of 1,486 feet – the third-deepest lake in the U.S. (after Crater and Tahoe). 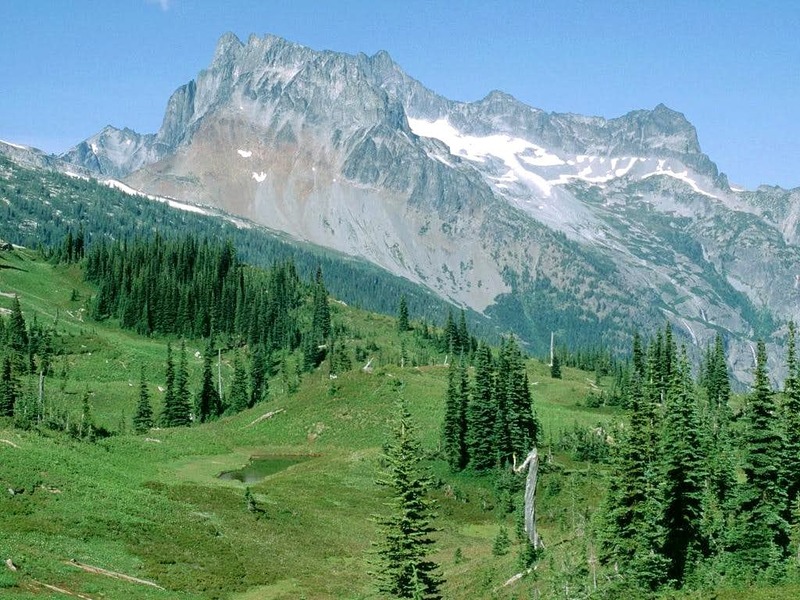 Bonanza Peak, at 9,516 feet, is Washington’s tallest non-volcanic mountain. The county seat of Chelan County is the city of Wenatchee (pop. 31,925), located at the confluence of the Columbia and Wenatchee rivers. 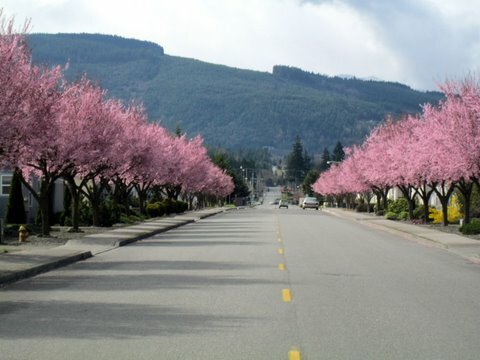 Wenatchee hosts the Washington State Apple Blossom Festival every spring. Amtrak’s “Empire Builder” train, which runs from Chicago to Seattle, stops at Wenatchee’s Columbia Station. There’s also a station in Leavenworth. Downtown Wenatchee has a statue of Guppo the Clown. Guppo has been played, for many years, by Paul K. Pugh, founder of the Wenatchee Youth Circus. 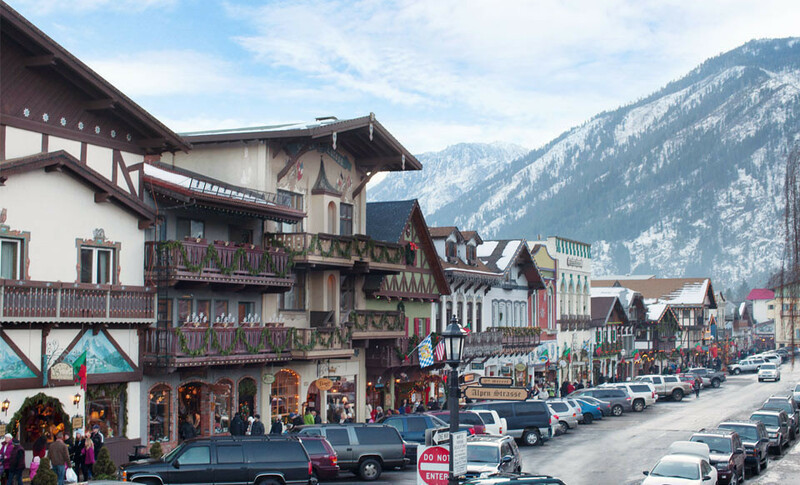 The city of Leavenworth (pop. 1,965), northwest of Wenatchee, was redesigned as a Bavarian village in the 1960s. The Leavenworth Ski Hill is nearby. The Leavenworth Nutcracker Museum – a museum about nutcrackers – opened in 1995. The city of Chelan (pop. 3,890) is at the southeastern tip of Lake Chelan. Lake Chelan Boat Company provides service from Chelan to the community of Stehekin, at the far end of the lake. 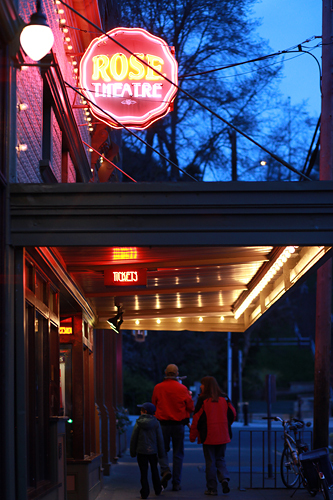 The Ruby Theatre in Chelan opened in 1913, and it’s still showing movies. Douglas County (pop. 38,431) is south of Okanogan County. It is one of 12 Douglas counties, all named for Sen. Stephen Douglas (1813-1861) of Illinois. The county is bordered on the north and west by the Columbia River. The central and eastern parts of the county are wheat-growing regions; the western part has many apple and cherry orchards. The county seat of Douglas County is the city of Waterville (pop. 1,138), third-smallest county seat in Washington. Its population has consistently been between 850 and 1,200 since 1910. The Nifty Theater in Waterville dates from 1919. Outside the Douglas County Museum in Waterville is a statue of a dowser – a man searching for water with a forked stick. The largest city in Douglas County is East Wenatchee (pop. 13,190), located across the Columbia River from Wenatchee, which is in Chelan County. 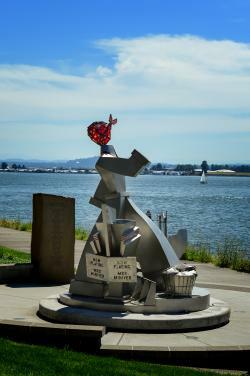 The Pangborn-Herndon Memorial Site commemorates the first nonstop flight across the Pacific Ocean – from Japan to East Wenatchee in 41 hours in 1931. The aviators were Clyde Pangborn and Hugh Herndon II. Lincoln Rock State Park is just north of East Wenatchee. The rock supposedly looks like Abe’s profile. The Columbia River is the county’s southern border. The 115-mile Okanogan River flows from north to south through the county. The river begins in British Columbia. The county seat of Okanogan County is the city of Okanogan (pop. 2,552). 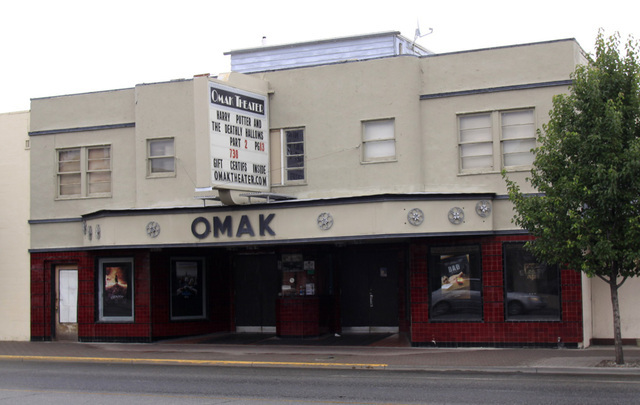 The county’s largest city is Omak (pop. 4,845), located nine miles northeast of Okanogan. 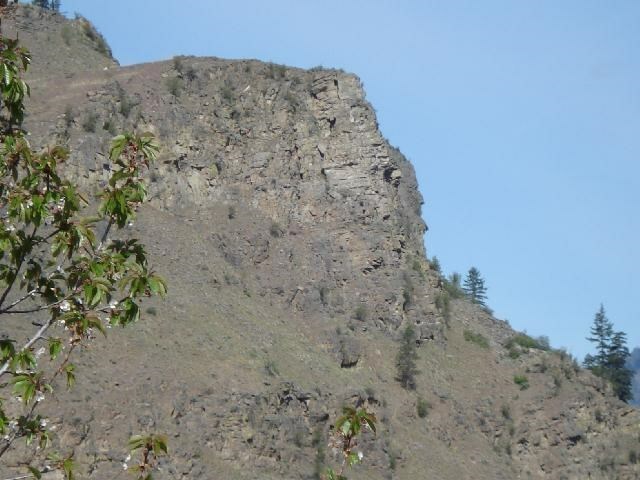 Just east of Omak, above Omak Lake on the Colville Indian Reservation, is the Omak Rock. 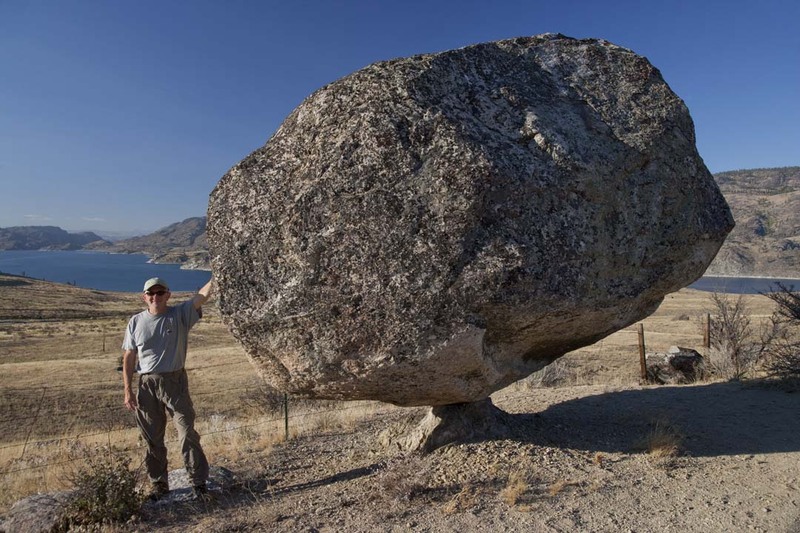 This balanced rock was carried from its original location by Ice Age glaciers. 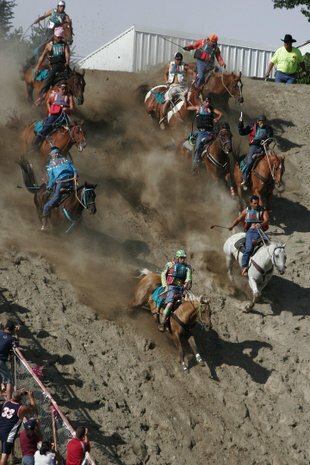 For more than 70 years, Omak has had an annual Suicide Race – a horse race that goes 225 feet down Suicide Hill, a 62-degree slope, to the Okanogan River. On the Colville Reservation, Chief Joseph (1840-1904), leader of the Wallowa band of the Nez Perce, is buried in the town of Nespelem (pop. 236). 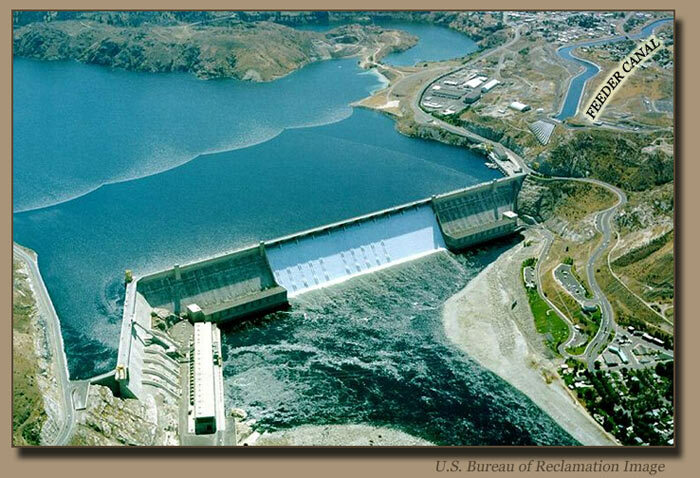 South of Nespelem, the Grand Coulee Dam (1942) crosses the Columbia River between Okanogan and Grant counties. Ferry County (pop. 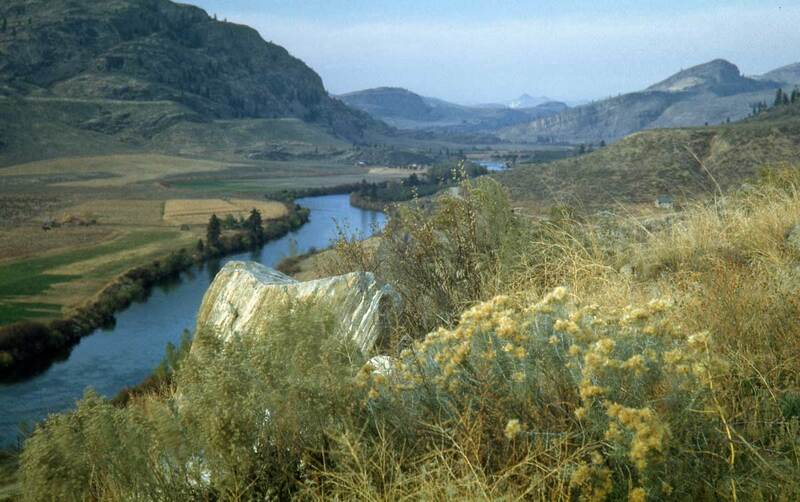 7,551) is along the Canadian border, between Okanogan and Stevens counties. 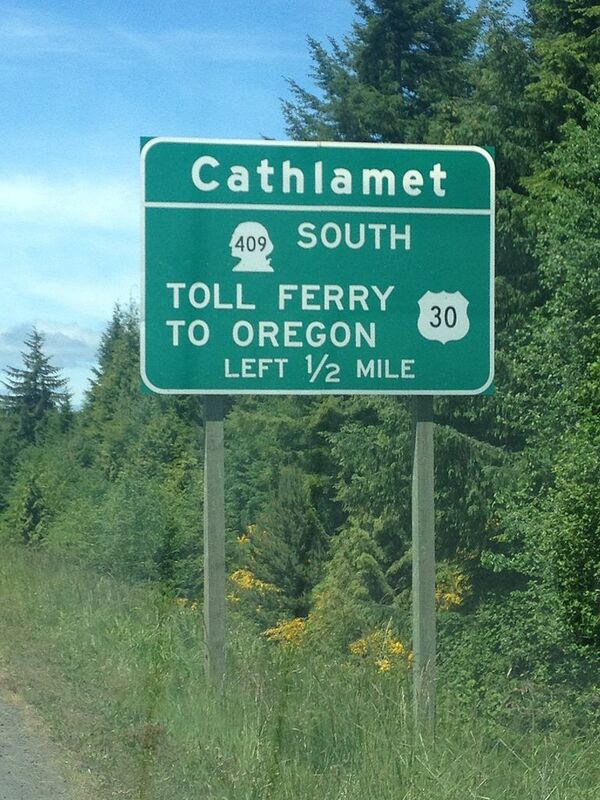 It’s the only Ferry County in the U.S. 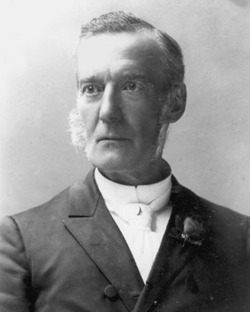 Although Ferry County is bordered by the Columbia and Kettle rivers on the south and east, it was not named for a river ferry; it was named for Elisha P. Ferry, first governor of the state of Washington. Much of the county is in the Kettle River Range, which runs north-south into British Columbia. The county’s southern part is in the Colville Indian Reservation. The county seat of Ferry County is the city of Republic, the second-smallest county seat in Washington, with a population of 1,073. Republic’s population has been around 1,000 for a century. Republic, founded by gold prospectors in the late 19th century, was named for the Great Republic mining claim. The Stonerose Interpretive Center and Fossil Site in Republic displays fossils from organisms that lived in the area in the Eocene Epic. Curlew Lake State Park is a few miles north of Republic. Lincoln County (pop. 10,570) is southwest of Stevens County. It’s one of 23 Lincoln counties in the U.S.
Lincoln County is one of the most productive wheat-growing counties in the U.S.
Only Whitman County produces more. 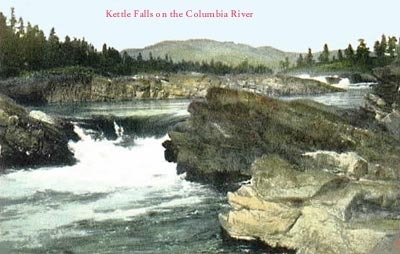 The Columbia and Spokane rivers form the northern border of the county. The county seat of Lincoln County is the city of Davenport (pop. 1,734). 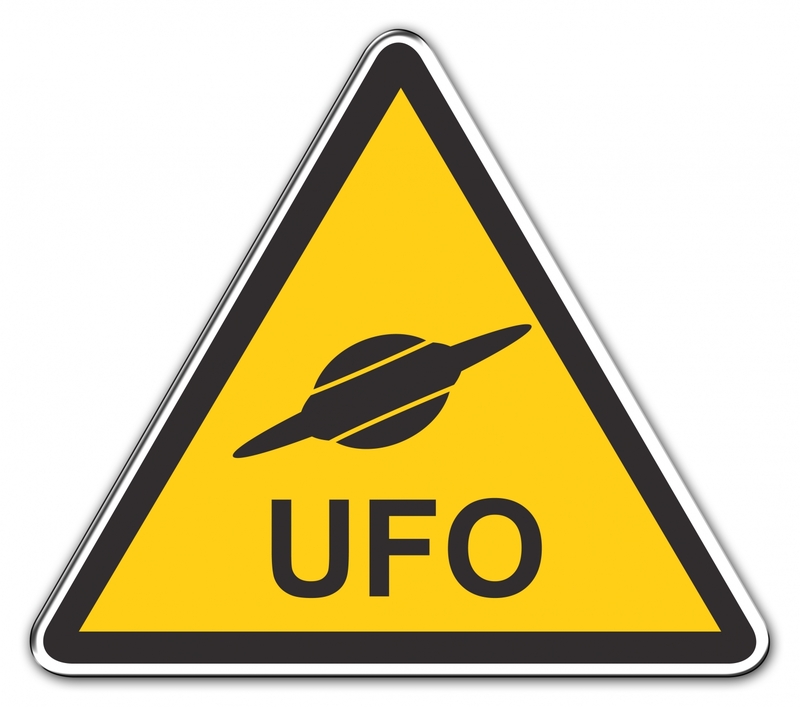 Davenport is the home of the National UFO Reporting Center, founded in 1974. West of Davenport on Highway 2, near the town of Creston (pop. 236), is a small roadside chapel, built of logs. East of Davenport is the town of Reardan (pop. 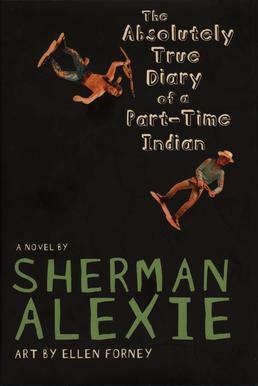 571), where author Sherman Alexie went to high school. In the southern part of the county, the town of Odessa (pop. 910) has an annual Deutschesfest, celebrating the German-Russian heritage of many of its residents. Stevens County (pop. 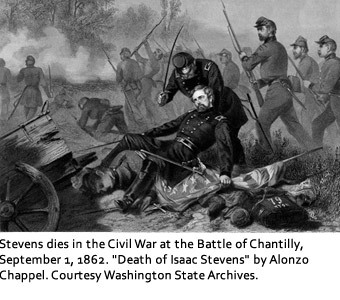 43,531) was named for Isaac Stevens (1818-1862), first governor of the Washington Territory. Kansas and Minnesota also have Stevens counties. Minnesota’s was also named for him. The county is bordered by British Columbia on the north, the Spokane River on the south, and the Columbia and Kettle rivers on the west. 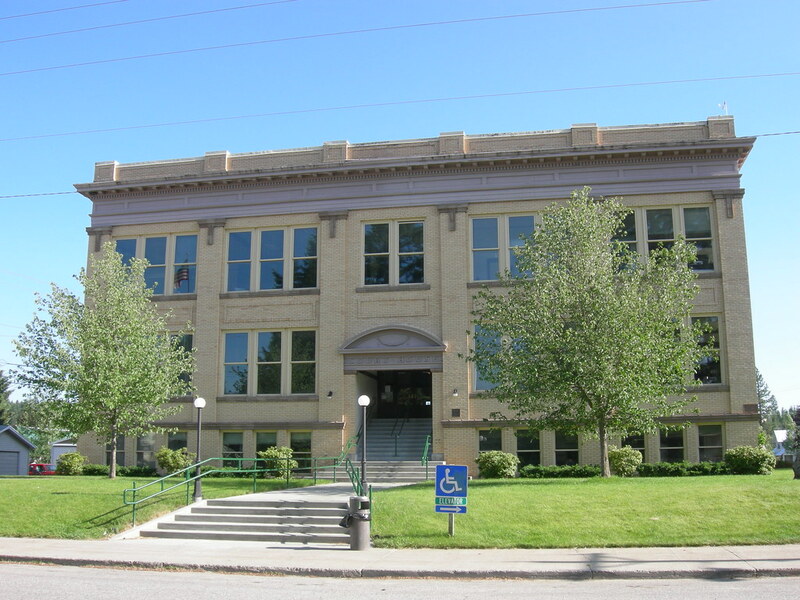 The county seat of Stevens County is the city of Colville (pop. 4,673). The Opera House and I.O.O.F. Lodge in Colville dates from 1911. 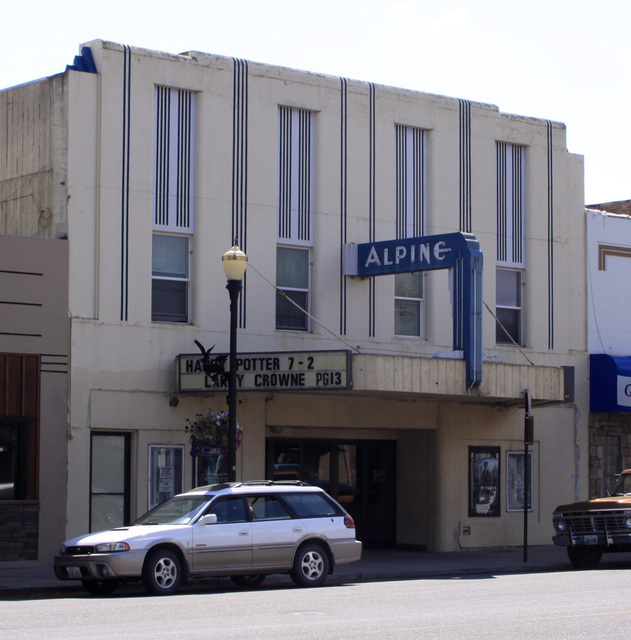 The Alpine Theater in Colville shows first-run movies. The Auto-Vue Drive-In in Colville was eastern Washington’s last drive-in theater when it closed in 2013. The city of Kettle Falls (pop. 1,595) was named for the nearby falls on the Columbia River – an important fishing site for Native Americans until it was covered by the waters of Franklin D. Roosevelt Lake in 1941. Pend Oreille (pond-uh-RAY) County is in the far northeastern corner of Washington, bordering Idaho and British Columbia. It has a population of 13,001. The county was named for the Pend d’Oreilles tribe. The name “Pend d’Oreille” is French for “hangs from ears.” The tribe received the name because of the large shell earrings that the people wore. They are also known as the Kalispel. The 130-mile Pend Oreille River enters the county from Idaho, then flows north into British Columbia; it joins the Columbia River in Canada. The Selkirk Mountains run north-south through the county. The county seat of Pend Oreille County is the city of Newport (pop. 2,126), in the southeastern corner of the county. The Roxy Theater in Newport opened in 1951. Newport is adjacent to the town of Oldtown, Idaho. The town of Metaline Falls (pop. 238) is in the northern part of the county, on the edge of Colville National Forest. The Cutter Theatre in Metaline Falls was built in 1912 as a school. It reopened as a theater in 1991. The building also has a library, classrooms, and an art gallery. Spokane County (pop. 471,221) is north of Whitman County. It is Washington’s fourth-most-populous county. The county seat of Spokane C0unty is the city of Spokane (pop. 208,916), second-largest city in Washington. The city and county were named for the Spokane tribe. Singer Bing Crosby (1903-1977) grew up in Spokane. 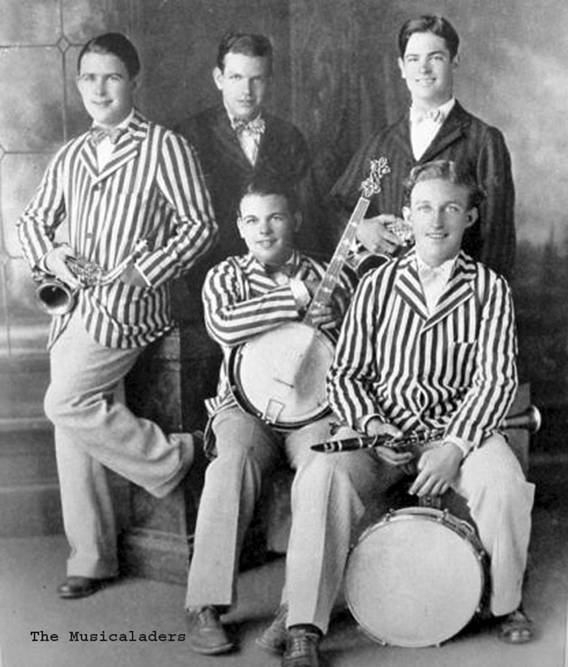 In 1926, Crosby and his band were the house band at Spokane’s Clemmer Theater (built in 1914). The theater was renamed the Bing Crosby Theater in 2006. 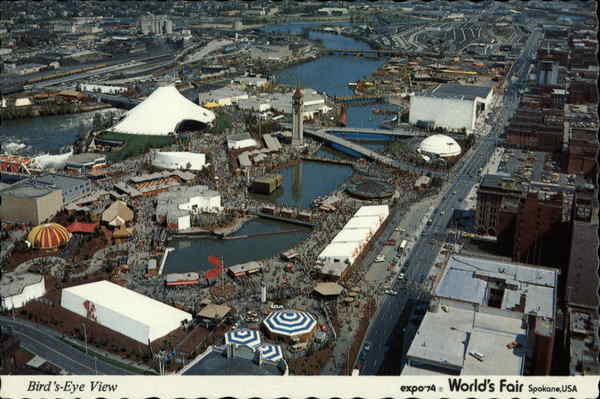 Spokane hosted a World’s Fair (Expo ’74) in the downtown area along the Spokane River. The fair featured the world’s first IMAX theater, inside the United States Pavilion. Riverfront Park now occupies much of the site. River Park Square is an enclosed shopping mall in downtown Spokane; it opened in 1974 and was renovated in 1999. 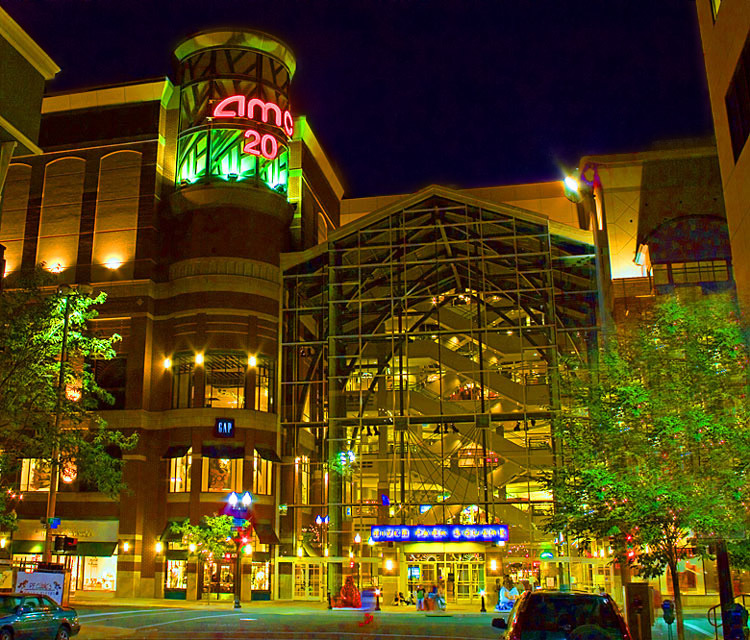 Anchor stores are Macy’s and Nordstrom. The movie theater has 20 screens. 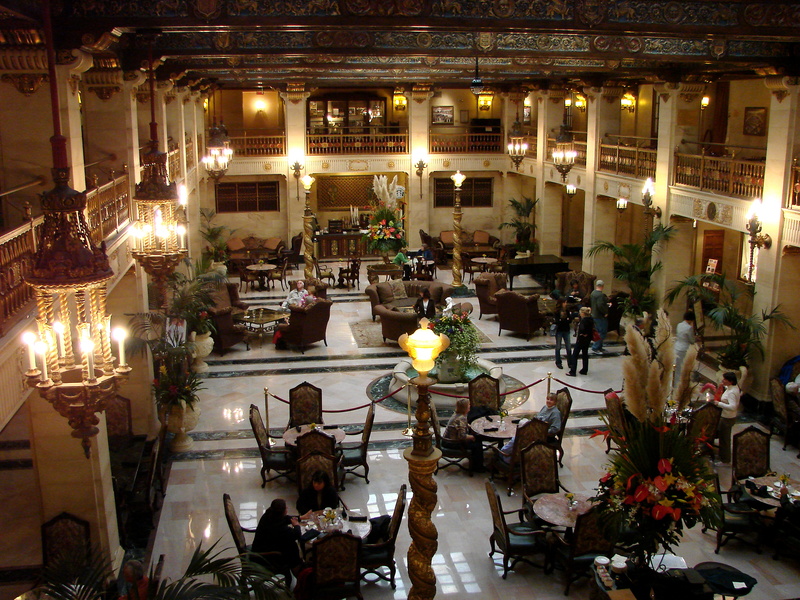 The Davenport Hotel in downtown Spokane, which opened in 1914, was the first U.S. hotel with air conditioning. It was renovated in 2002. 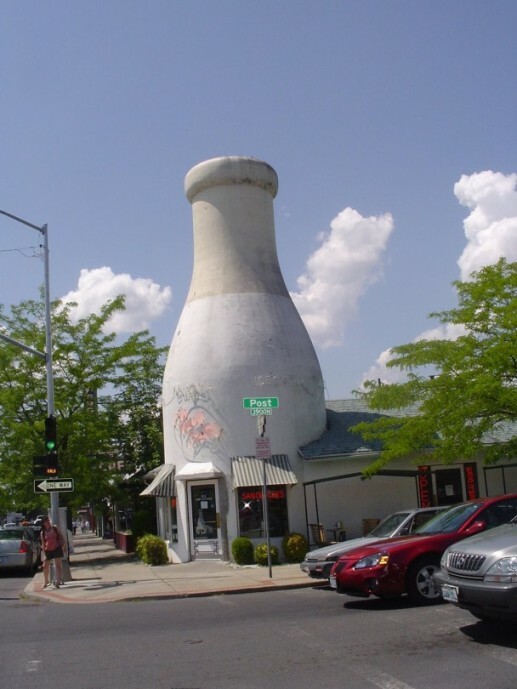 The two Benewah Dairy Company milk bottles are local landmarks in Spokane. 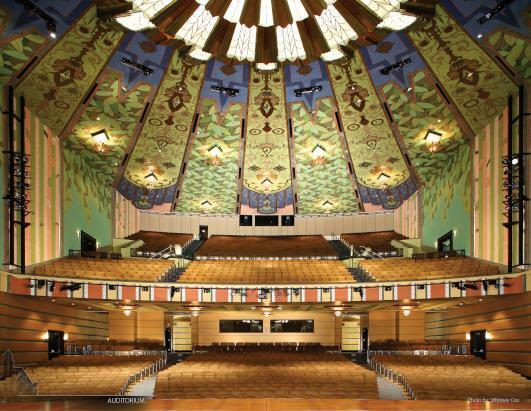 The Fox Theater, built in 1931 in the Art Deco style, is now the Martin Woldson Theater. It is the home of the Spokane Symphony. Another local landmark is the giant red wagon in Riverfront Park. It was built in 1990. It has a slide for children. Father’s Day was founded at the YMCA in Spokane in 1910. It is now celebrated in the U.S. on the third Sunday in June. Spokane is the home of Gonzaga University, a Roman Catholic university founded in 1887, and Whitworth University (1890), affiliated with the Presbyterian church. John Stockton is in the Basketball Hall of Fame. 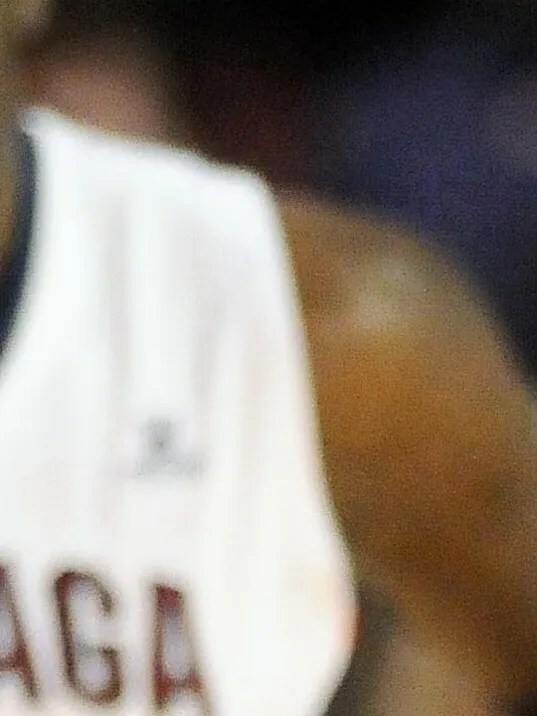 About 16 miles southwest of Spokane is the city of Cheney, home of Eastern Washington University, a public university with about 12,000 students. 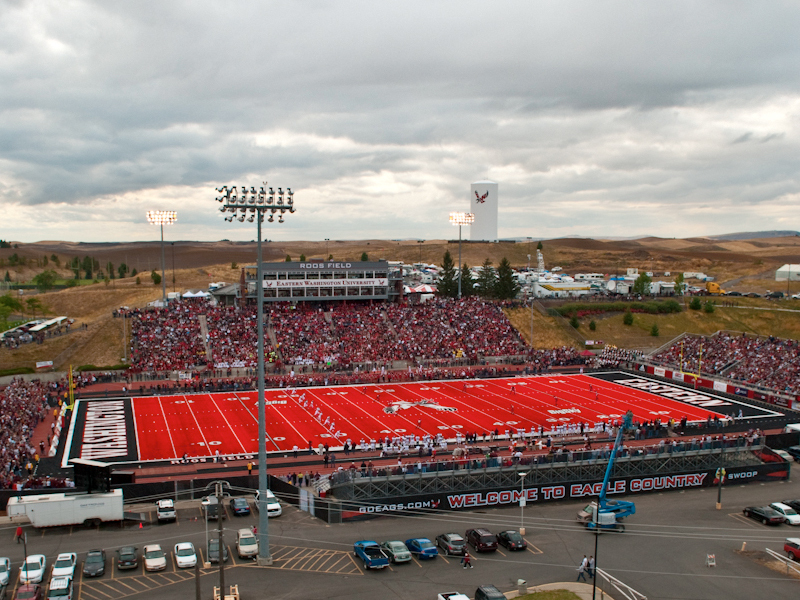 12,000-seat Roos Field has red turf. Mount Spokane State Park, northeast of Spokane, is Washington’s largest state park. The mountain is 5,883 feet tall. It has a ski area. Whitman County is in southeastern Washington, along the border with Idaho. The Snake River is the county’s southern border. 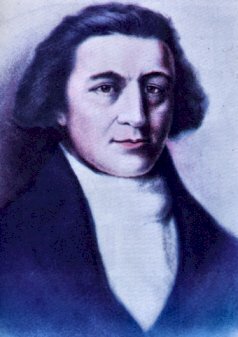 The county was named for Marcus Whitman (1802-1847), who started a mission for the Cayuse tribe in the area that became Walla Walla. 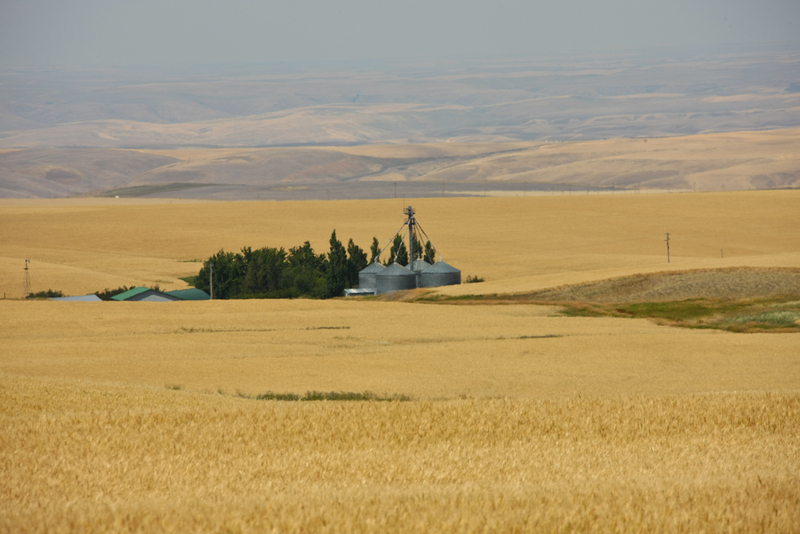 Whitman County is in the rich agricultural area known as the Palouse. Barley, wheat, dry peas, and lentils are important crops. The county seat of Whitman County is the city of Colfax (pop. 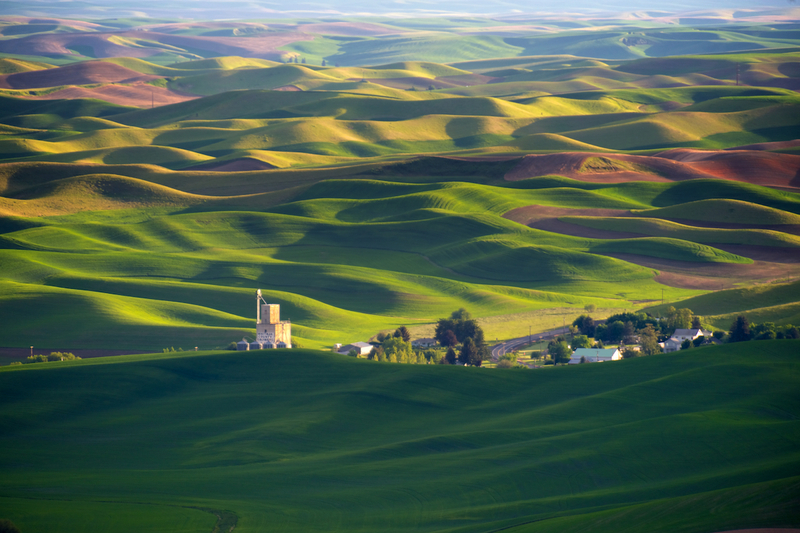 2,805), located at the confluence of the north and south forks of the Palouse River. 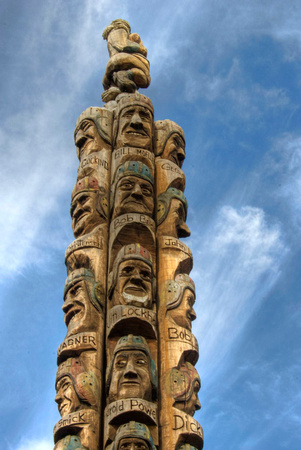 The Codger Pole is a 65-foot, chainsaw-carved sculpture in Colfax. Created in 1991, it commemorates a high school football game played in 1938. 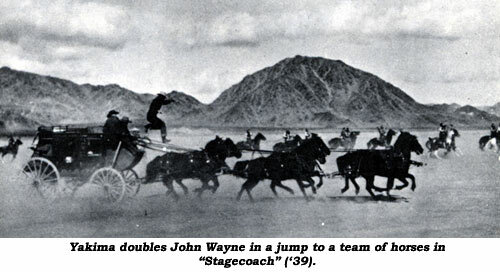 Stuntman and rodeo star Yakima Canutt (1895-1986) was born and raised in the Colfax area. 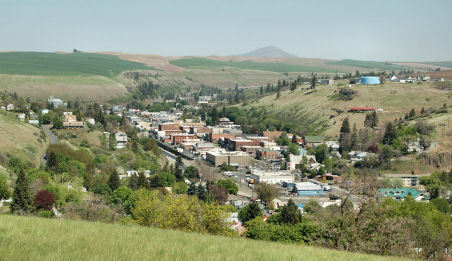 The largest city in Whitman County is Pullman (pop. 29,799), home of Washington State University. Founded in 1890, WSU is Washington’s land grant university. Pullman is only about nine miles from Moscow, Idaho – home of the University of Idaho. Pullman was named for George Pullman (1831-1897), founder of the Pullman Palace Car Company, which manufactured and operated the Pullman sleeping cars that were once ubiquitous on American long-distance trains. Pullman hosts the National Lentil Festival every year. Palouse Falls State Park is in the southwestern part of Whitman County, near where the Palouse River enters the Snake River. The waterfall is in both Whitman and Franklin counties. Adams County (pop. 18,728), east of Grant County, is shaped liked a horizontal reflection of Oklahoma. 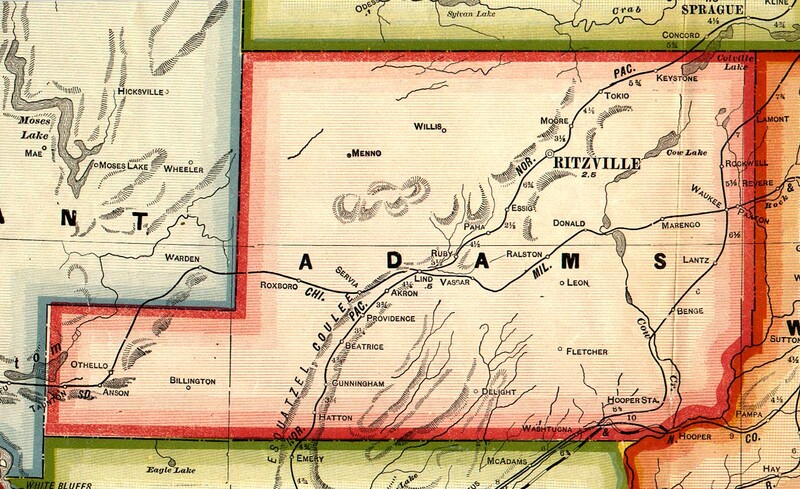 The 12 Adams counties in the U.S. are named for four different Adamses. 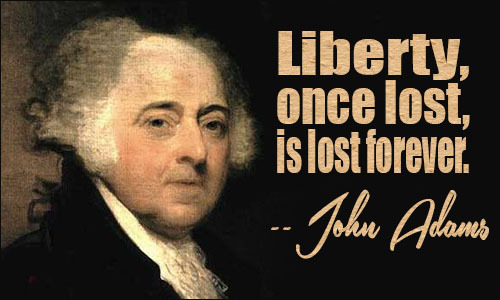 This Adams County was named for John Adams (1735-1826), the second president. 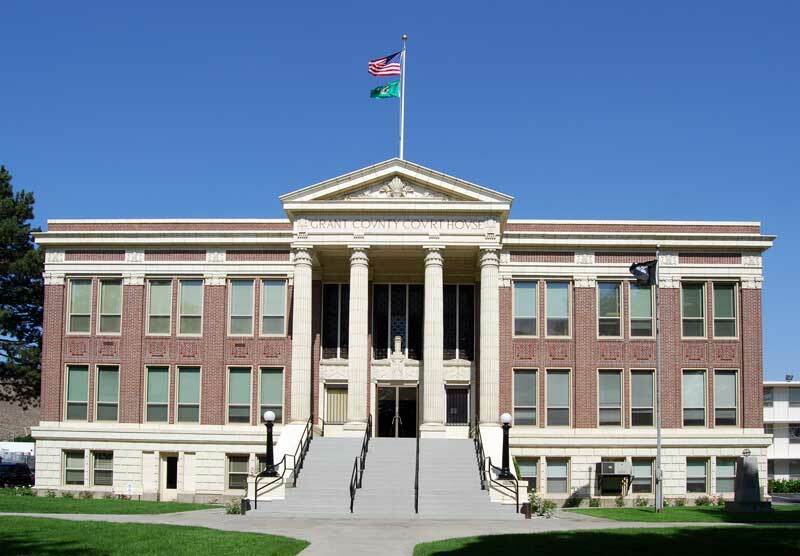 The county seat of Adams County is the city of Ritzville (pop. 1,673), one of Washington’s smallest county seats. 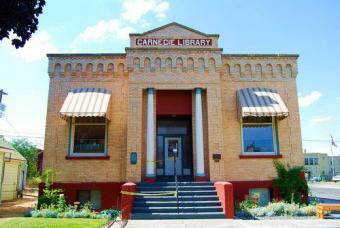 Ritzville’s Carnegie Library (1907) is still open as the city’s library. 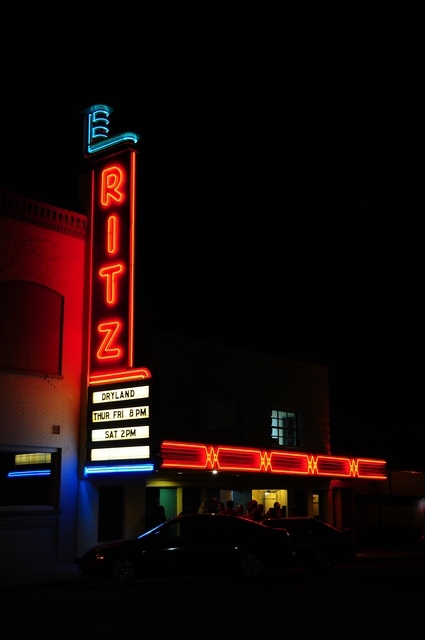 The Ritz Theatre in Ritzville opened in 1937. The largest city in Adams County is Othello (pop. 7,364), located in the irrigated agricultural area in the county’s southwestern corner. 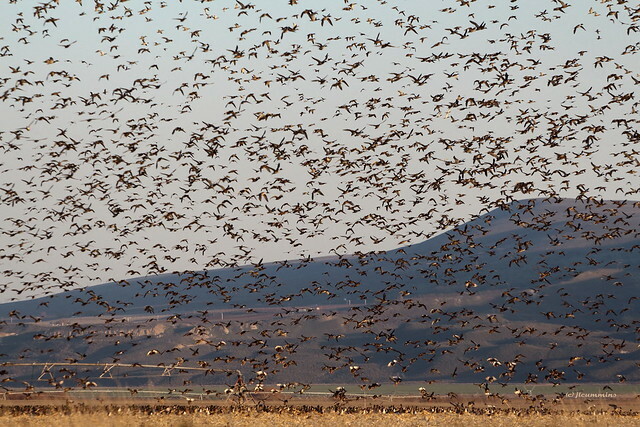 Columbia National Wildlife Refuge is just outside Othello. The city of Lind (pop. 572) is known for its annual Combine Demolition Derby. 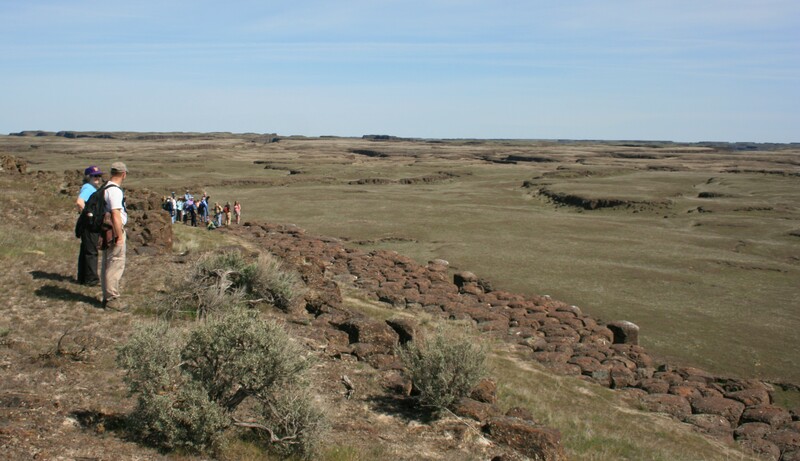 Adams County is in the middle of the eastern Washington region known as the “Channeled Scablands” – a barren area that apparently resulted from massive flooding, about 13,000 years ago, at the end of the last Ice Age. Grant County (pop. 89,120) is northwest of Franklin County. It is one of 14 Grant counties (and one Grant parish) in the U.S., most of them named for President Ulysses S. Grant (1822-1885). 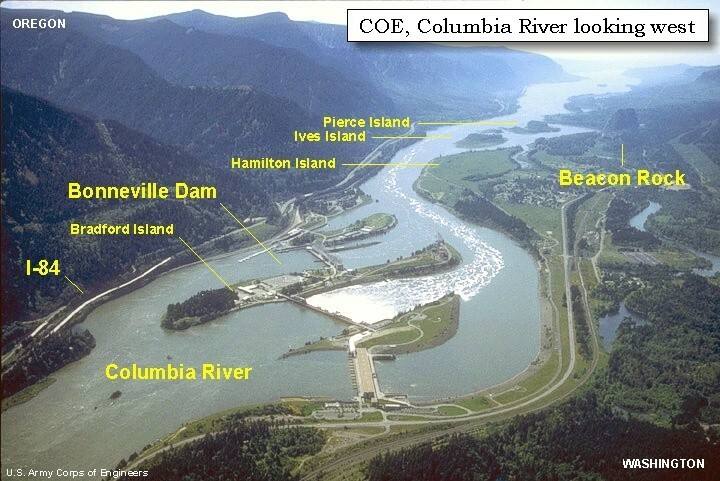 The Columbia River makes up part of the southern and western borders of the county; the Grand Coulee Dam (on the Columbia) is in the far northeastern corner of the county. 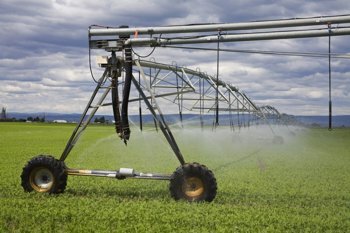 Construction of the Grand Coulee Dam (1933-1942) eventually led to the Columbia Basin Project – the largest water reclamation project in the U.S. As a result, a huge area of former desert in southern Grant County is now irrigated farmland. More than 40 different crops are grown in the county, including tree fruit, wheat, corn, and a variety of vegetables. The county seat of Grant County is the city of Ephrata (pop. 7,664). 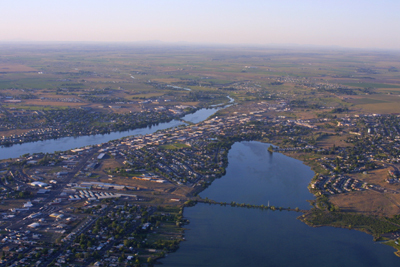 The largest city in Grant County is Moses Lake. Its population was 328 in 1940, before the Columbia Basin Project began. By 1960, the population was 11,299, and in 2010 it was 20,366. 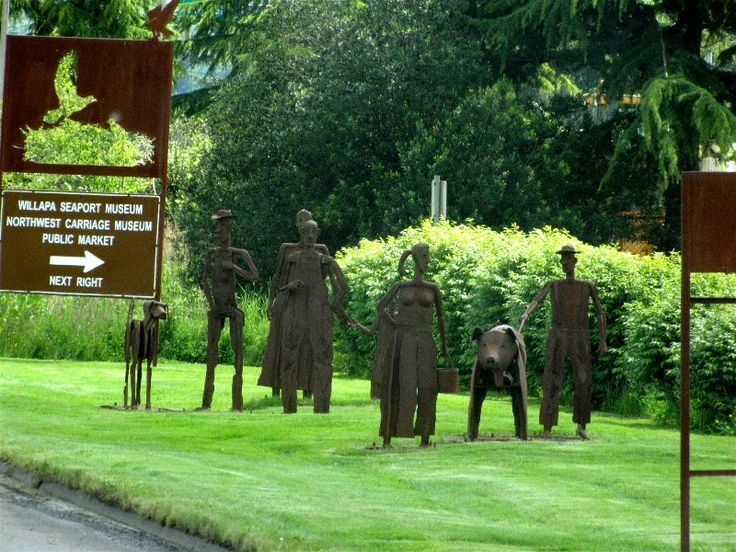 The Moses Lake Museum and Art Center has a life-size sculpture of a Columbian mammath, made entirely of farm implements. The city of Mattawa (pop. 4,437) has a library constructed with 330 bales of straw, plus wire mesh and stucco. First one in the U.S. 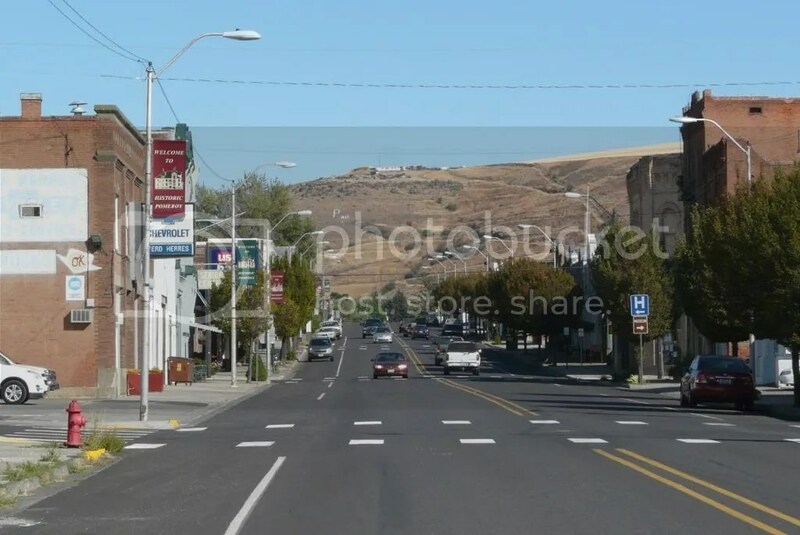 The city of Soap Lake (pop. 1,514) is the home of the 9-hole, par-3 Lava Links Desert Golf, where golfers play through sagebrush, sand, and desert vegetation. The city of George (Washington) has a population of 501. The “World’s Largest Cherry Pie” is baked there every July 4. 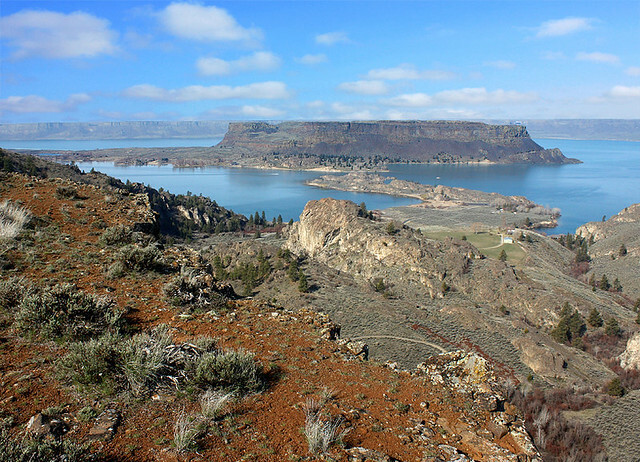 Steamboat Rock State Park and Sun Lakes-Dry Falls State Park are in Grant County. 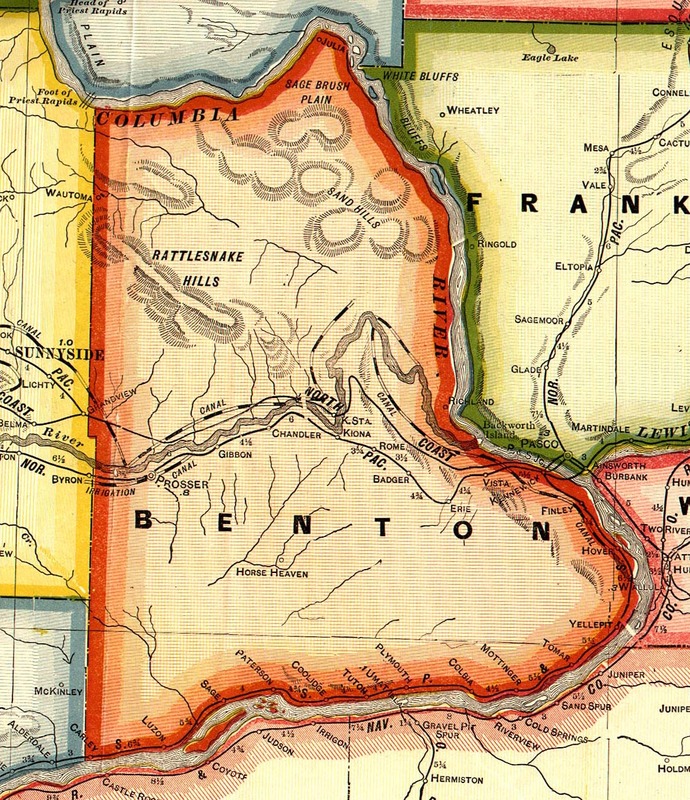 Benton County (pop. 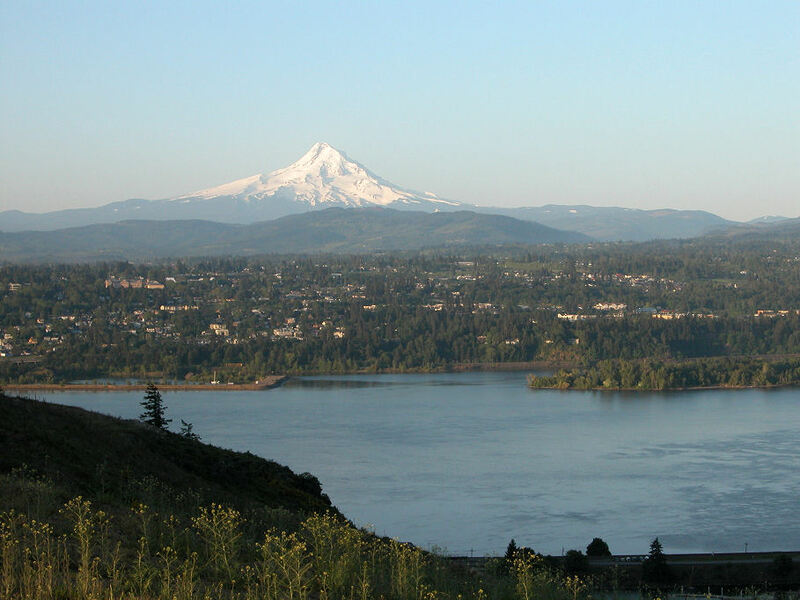 175,177) is bordered by the Columbia River on its north, south, and east sides. 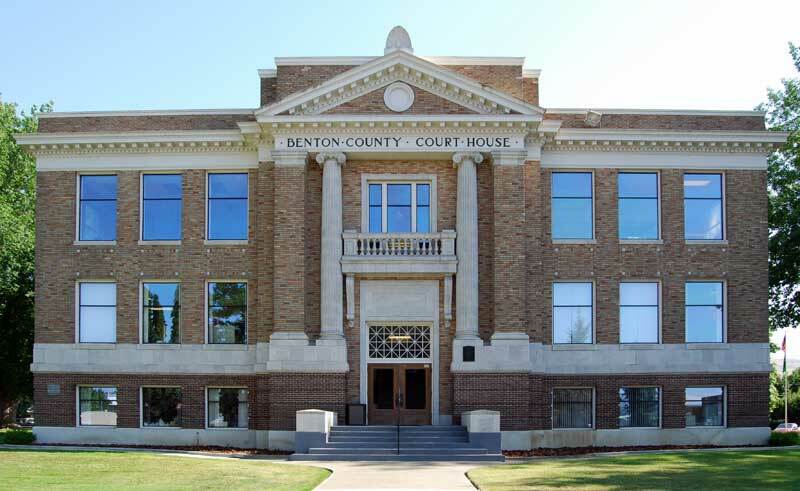 It is one of nine Benton counties in the U.S. and one of seven named for Thomas Hart Benton (1782-1858), U.S. senator from Missouri and a strong advocate of the country’s westward expansion. 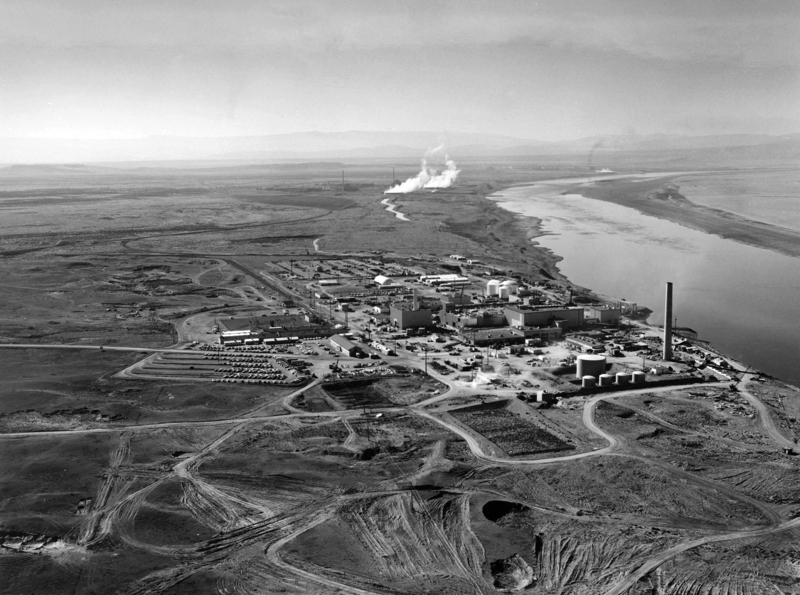 Benton County is best known for the 586-square-mile Hanford Site, established in 1943 as part of the Manhattan Project to produce plutonium for the first nuclear bombs. The small town of Hanford was abandoned when the Hanford Site was built. Today, a main focus at the Hanford Site is the environmental cleanup; the site also has an operating nuclear power plant and various centers of scientific research. The Hanford Reach is a 51-mile, free-flowing area of the Columbia River, much of it adjacent to the Hanford Site. Hanford Reach National Monument was created in 2000. The county seat of Benton County is the city of Prosser (pop. 5,714), located on the Yakima River in the western part of the county. Most of the population of Benton County lives in the Tri-Cities area of Richland, Kennewick, and Pasco. along the Columbia River. Richland and Kennewick are in Benton County. Kennewick (pop. 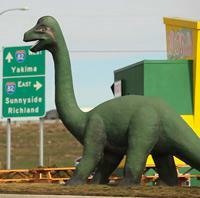 73,917) is the largest of the Tri-Cities. 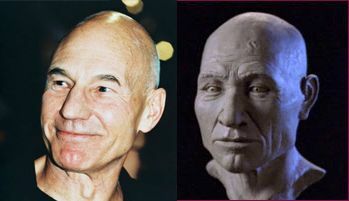 It is famous for Kennewick Man, a prehistoric man from about 7000 B.C., who was discovered along the Columbia River there in 1996. The Cable Bridge (1978), connecting Kennewick and Pasco, is one of seven major bridges in the Tri-Cities area. 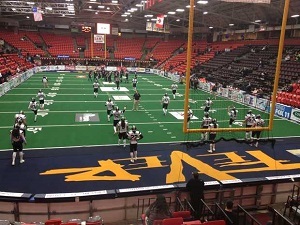 The 7,700-seat Toyota Center (1988) in Kennewick is the home of the Western Hockey League’s Tri-City Americans and the Indoor Football League’s Tri-Cities Fever. The Fever were founded in 2005. Richland (pop. 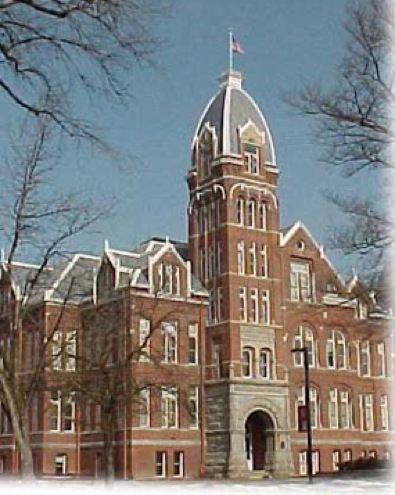 48,058) is the home of Washington State University Tri-Cities, founded in 1989. 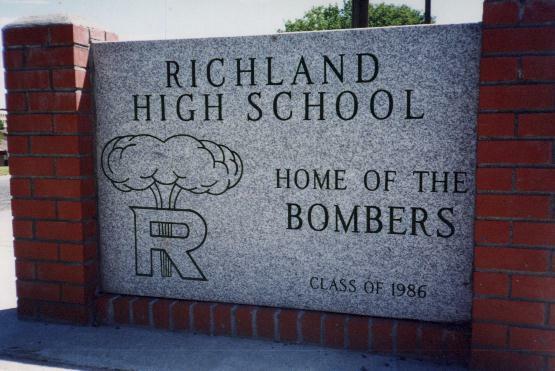 At Richland High School, the sports teams are known as the Bombers. Actress Sharon Tate was Miss Richland of 1959. She was one of five people killed by the Manson Family in 1969 in Los Angeles. Walla Walla County (pop. 58,781) is bordered by the Snake River on the north, the Columbia River on the west, and Oregon on the south. It was named for the Walla Walla tribe. 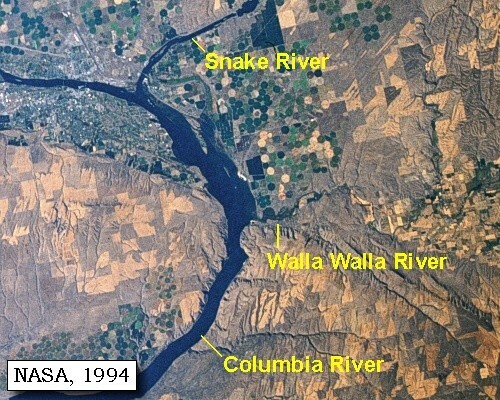 The Walla Walla River begins in the Blue Mountains of Oregon before flowing west through Walla Walla County and entering the Columbia River. The county seat, the city of Walla Walla (pop. 31,731), is in the southern part of the county, a few miles north of the Oregon border. The area has more than 100 vineyards. 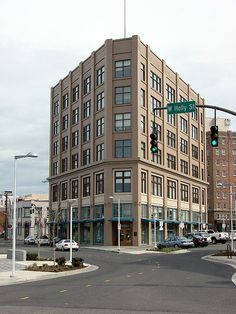 The 13-story Marcus Whitman Hotel in downtown Walla Walla dates from 1927. The hotel is named for Dr. Marcus Whitman (1802-1847). 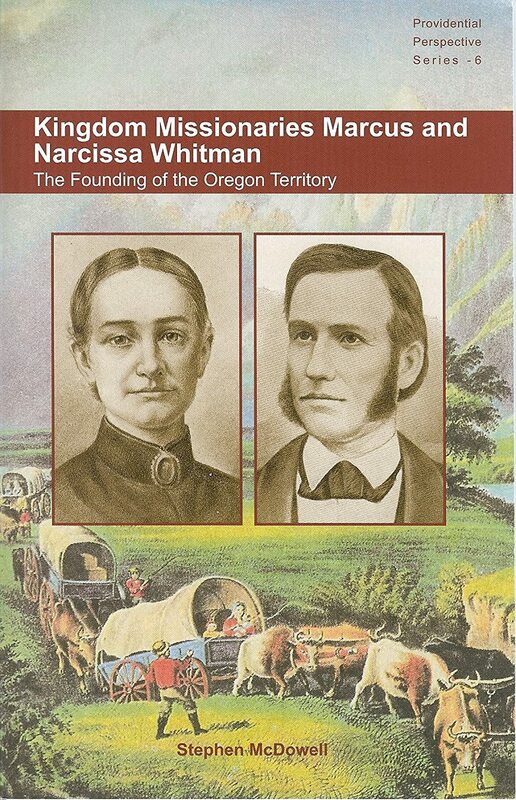 Whitman and his wife, Narcissa, started a mission to the Indians in the area in 1836. They died in the “Whitman Massacre” of 1847. 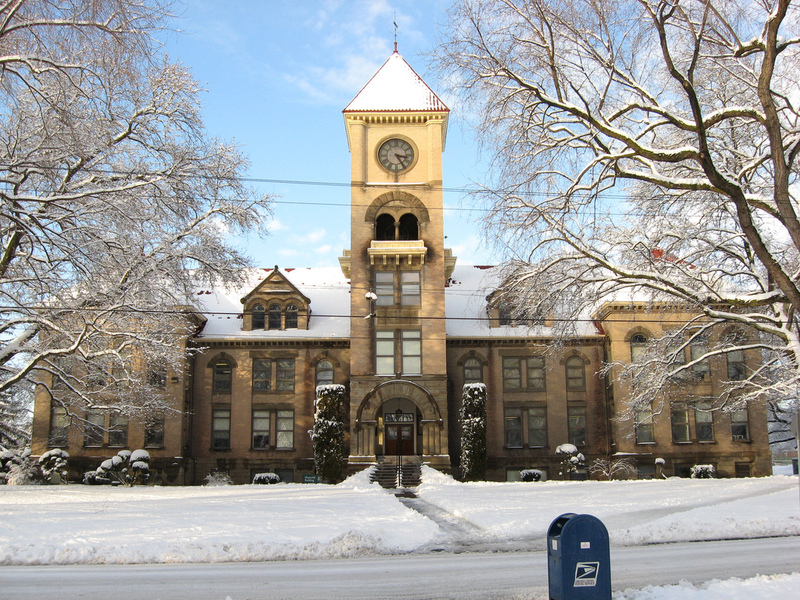 Whitman College in Walla Walla was founded in 1859. The private, liberal-arts college has about 1,500 students. William O. Douglas (1898-1980), the longest-serving justice on the U.S. Supreme Court (1939-1975), graduated from Whitman College. The Liberty Theater in downtown Walla Wall, built in 1917, is now part of a Macy’s department store. 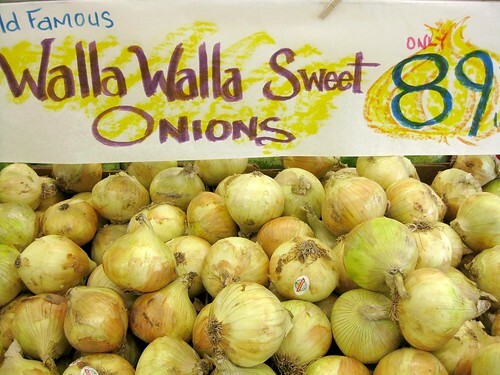 Walla Walla sweet onions were first developed in the area in about 1900; the seeds came from Corsica. 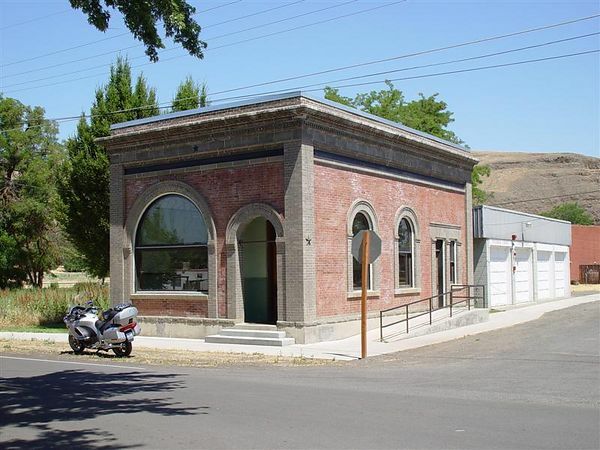 Walla Walla’s Northern Pacific Railway depot (1914) now has a restaurant. Passenger service ended in 1956. 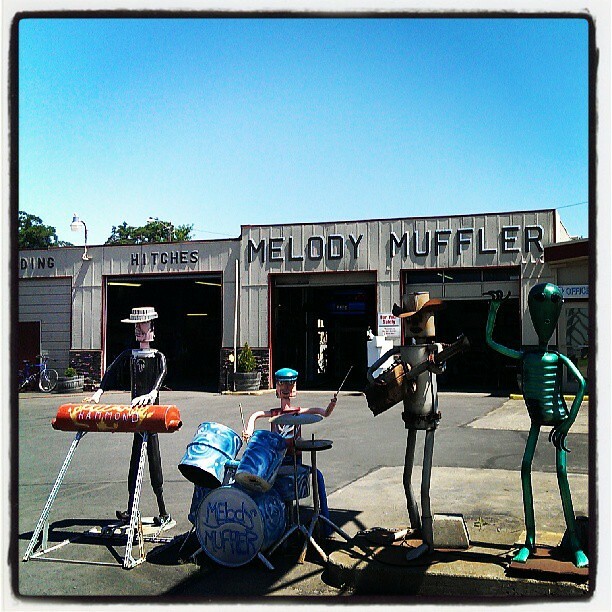 Melody Muffler in Walla Walla is known for its “muffler art” metal sculptures created by owner Mike Hammond. Walla Walla has been the home of the Washington State Penitentiary since 1887. Columbia County (pop. 4,078) is the third-least-populous county in Washington. It reached its peak population of 7,128 in 1900. The county is named for the Columbia River; the Snake River, a Columbia tributary, is the county’s northern boundary. 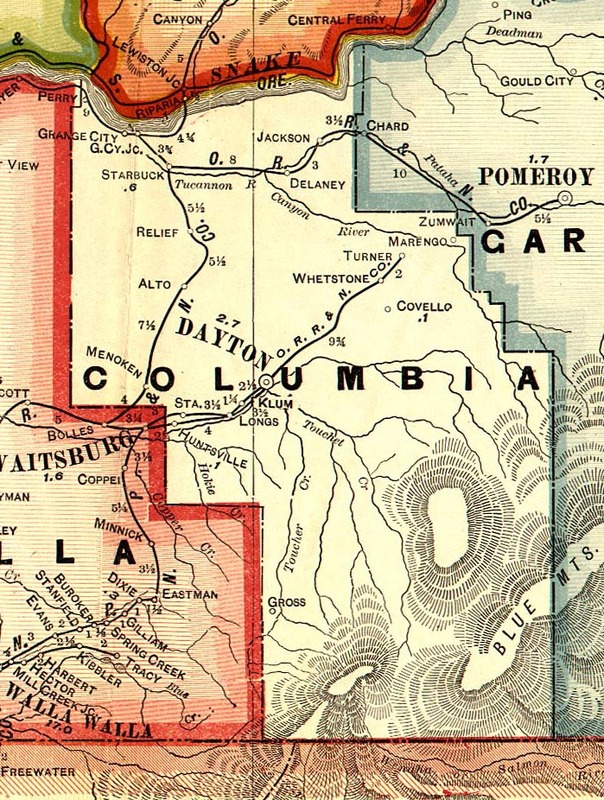 The county seat of Columbia County is the city of Dayton (pop. 2,526). 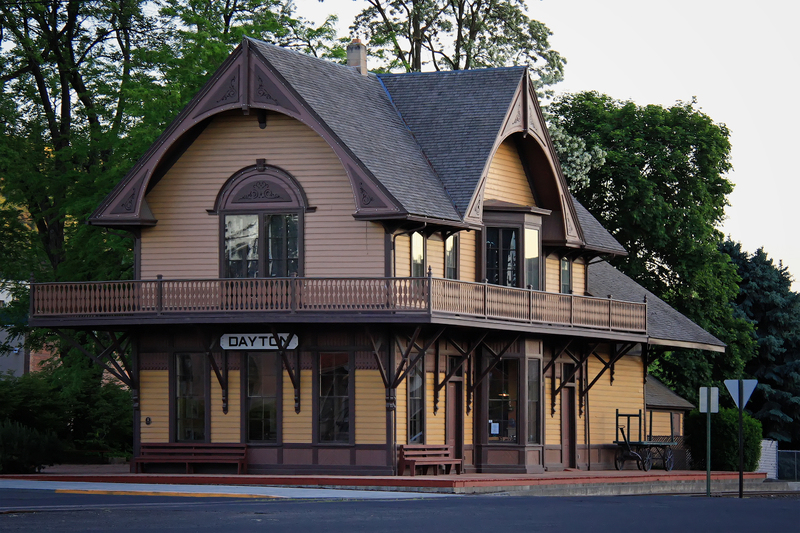 Dayton has the oldest surviving railroad depot in the state. It dates from 1881. The restored Liberty Theater in Dayton was built in 1921. It now has a mixture of films and live performances. In the town of Starbuck (pop. 129), the former Bank of Starbuck (1904) is now City Hall. The Blue Mountains and Umatilla National Forest are in the southern part of the county. Ski Bluewood is an alpine ski area in the Blue Mountains, southeast of Dayton. It has a vertical drop of 1,125 feet. Garfield County (pop. 2,266) is the least-populous county in Washington. 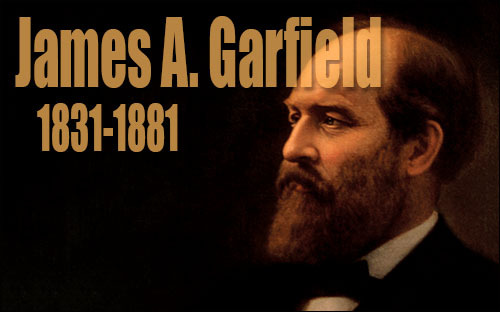 It is one of six Garfield counties in the U.S., all west of the Mississippi and all named for James A. Garfield, the 20th president. Garfield County is in a wheat-growing area. Its population has declined steadily from a peak of 4,199 in 1910, as farms have gotten larger and farmers have gotten fewer. The oddly shaped Garfield County is bordered by the Snake River on the north and Oregon on the south. The county seat of Garfield County is the city of Pomeroy (pop. 1,425) – the county’s only city. 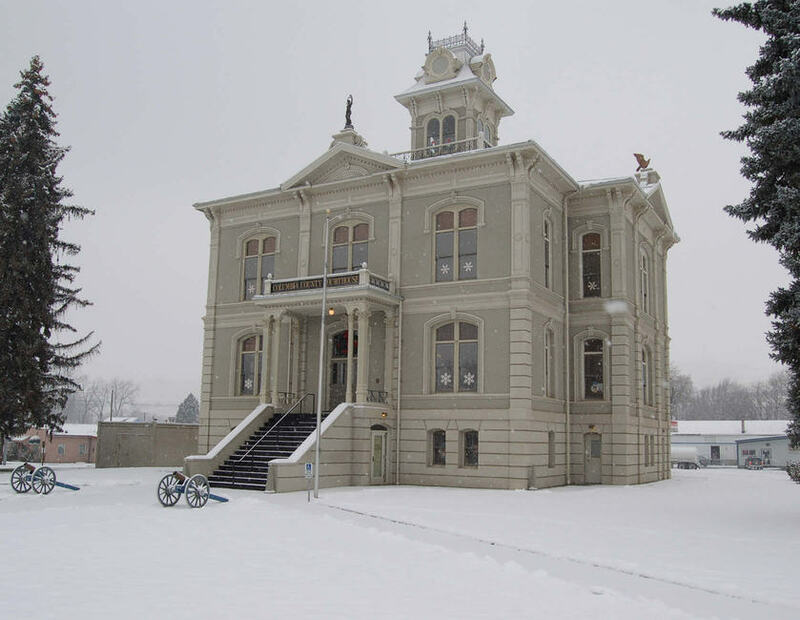 The Garfield County Courthouse was built in 1901 in Late Victorian style. It replaced a wooden courthouse that burned down. The Seeley Theater in Pomeroy is undergoing restoration. 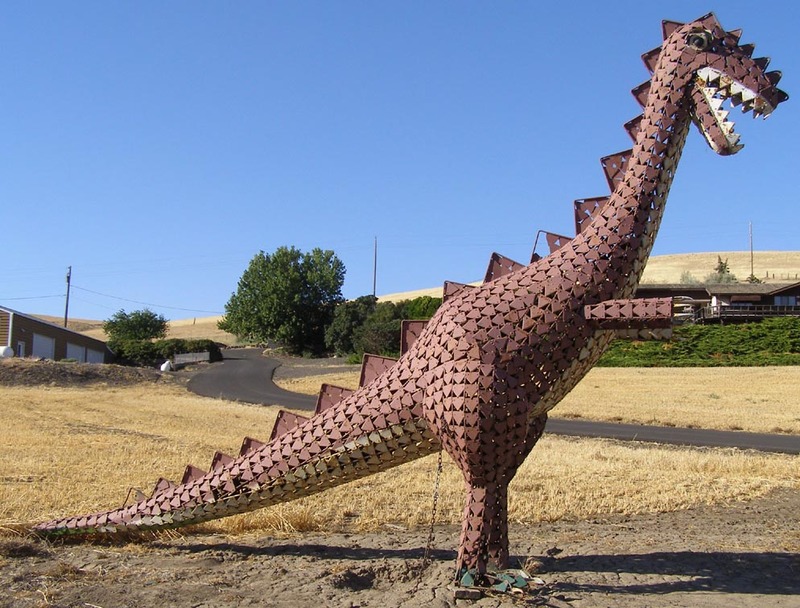 A collection of metal animal sculptures can be found along Highway 12, a few miles east of Pomeroy. 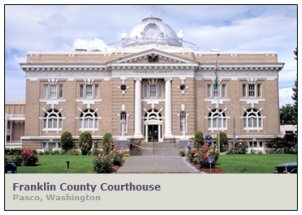 We begin our virtual trip through the 39 counties of Washington in Asotin County, located in the far southeastern corner of the state. This is the route that we’ll be taking. The county is bordered by Oregon on the south and by the Snake River and Idaho on the east. The county seat of Asotin County is the city of Asotin (pop. 1,251), fourth-smallest county seat in Washington. Six miles north of Asotin is Clarkston (pop. 7,229), the county’s largest city. 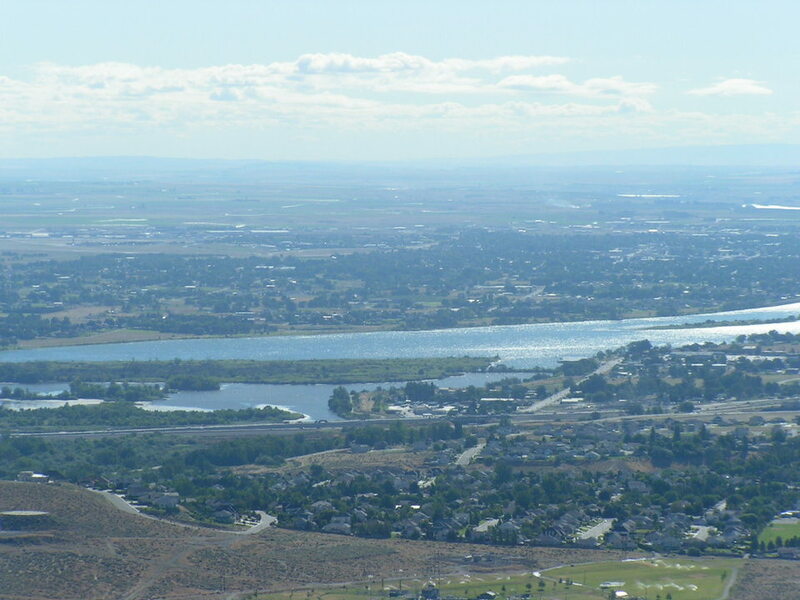 Clarkston is at the confluence of the Snake and Clearwater rivers, across the Snake from Lewiston, Idaho. 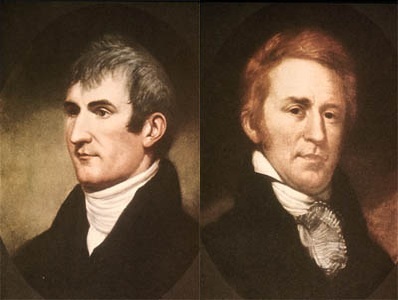 Clarkston and Lewiston, in the Lewis-Clark Valley, were named for Meriwether Lewis and William Clark, who explored the area on their 1804-06 Corps of Discovery Expedition. They never set foot on the Clarkston side. Clarkston’s ZIP Code of 99403 is the highest ZIP code in the contiguous United States. 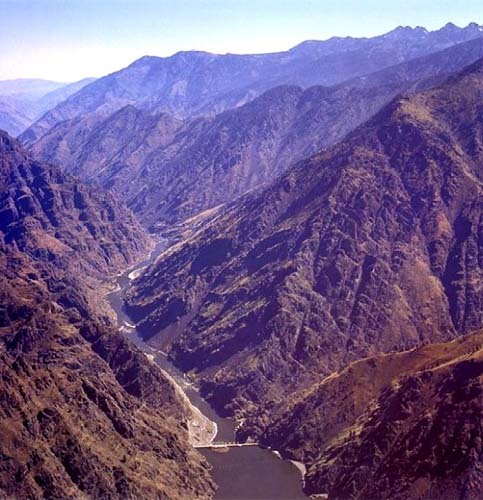 The Lewis-Clark Valley is considered the Gateway to Hells Canyon – the canyon on the Snake River between Oregon and Idaho that is North America’s deepest river gorge. Fields Spring State Park is in the southern part of the county. 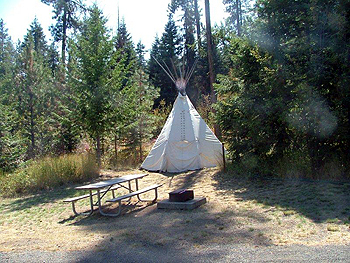 It has the only two teepees in Washington state parks – available for campers for $30 per night.